MADE BEFORE WWII WHETHER RUNNING OR NOT. PLEASE CONTACT ME IF YOU HAVE ANYTHING FOR SALE. THE OLDER AND MORE UNUSUAL THE BETTER. My shop click on the photo for larger view. This is a piston and rod assembly from a Nordberg inline 6 cylinder. These were manufactured in Milwaukee and St. Louis from 1920-1973. This particular piston and rod is from an engine manufactured in 1944 and was used for marine propulsion (navy battleship). 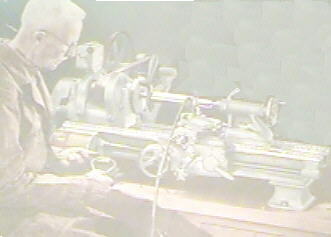 The bore is 21.500" with a stroke of 29.00". This engine runs at 225 rpm and produces approximately 1,500kw at 2,000 h.p. This piston and rod assembly weighs in at a mere 4,000 lbs. Yes that's me in the blue coveralls standing next to it. 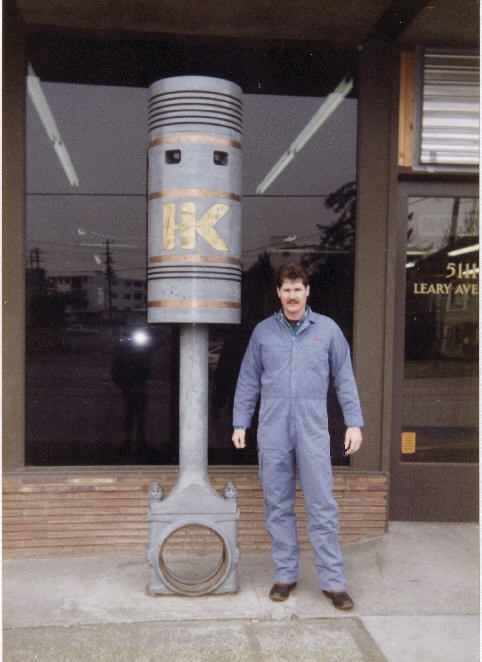 I stand 6' 3" tall and weigh 210 pounds just to give you an idea of the size of this piston and rod. Collecting and restoring antique electric fans and heaters is my hobby but machine shop work is my trade. My grandfather was a machinist who owned a machine shop and I spent much time there as a young boy. After graduating high school I attended Aiken Technical College where I completed the Machine Tool Technology program and have been doing this type of work ever since. After more than 37 years of machining I still enjoy my work. I thrive on a challenge to recreate a complicated part that is now obsolete and otherwise unavailable. 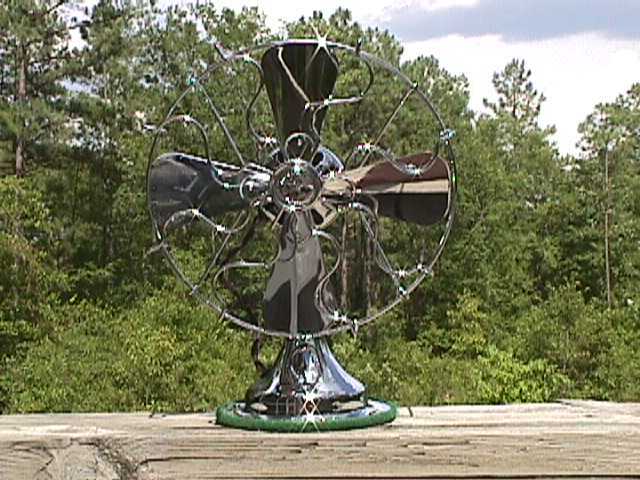 Below are some hyperlinks that you can click on and see some of the fans from my collection. Some of these fans I have restored and some are original "as found" condition. After viewing the photo from the link you can click your "back" key to get back to this page. 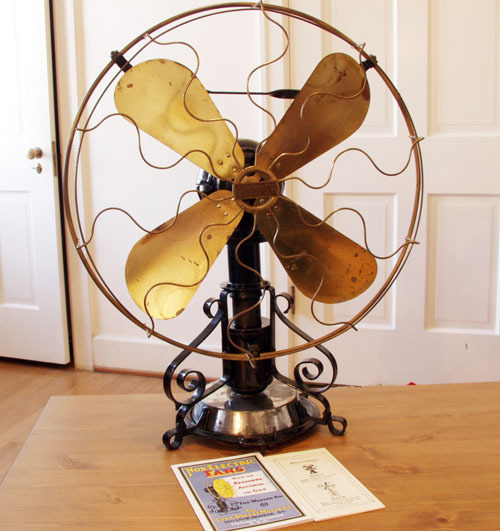 12" Victor Lollipop oscillating vane fan (View 1) This fan was patented in 1903. 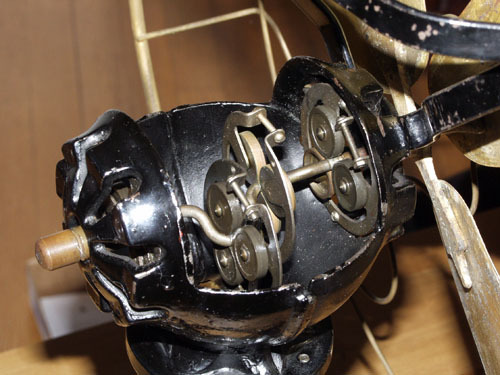 Before the days of gear driven oscillating fans, manufacturers only knew how to make a fan oscillate back and forth by means of a deflecting vane placed in front of the blade. 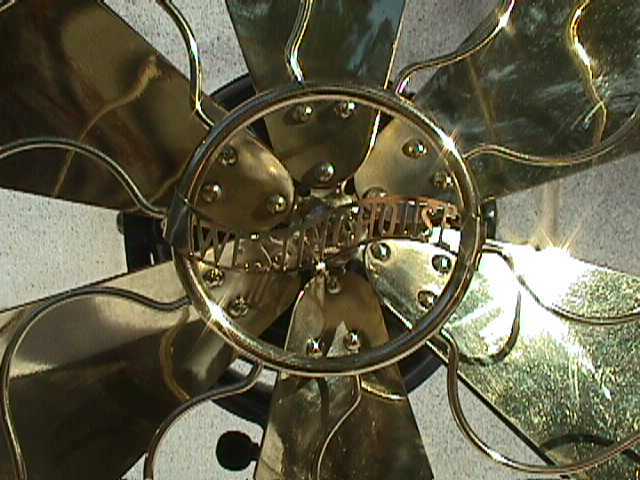 The vane deflects the air coming off of the blade and causes the motor to push to the opposite side where a return stop is hit by the counterweight on the bottom of the lollipop stem and flips the vane over to the other side thereby causing the fan motor to be pushed to the other side. Have you ever held your hand out the car window pretending to be the wing of an airplane? When you tilt your hand down the wind causes your hand to go down, and when you tilt your hand up, the wind causes it to "lift". This is exactly how the vane fan works. 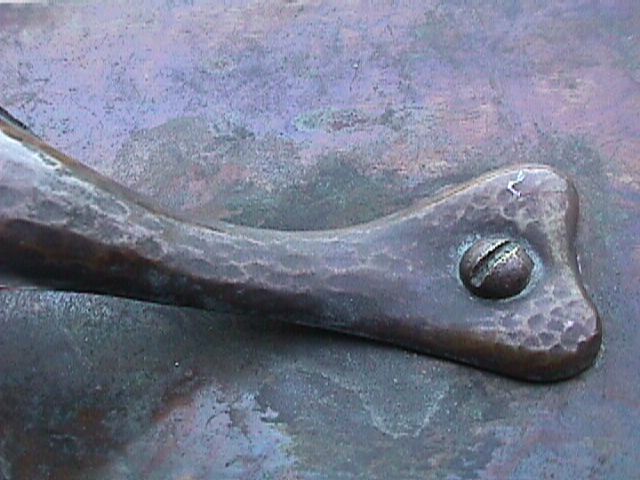 Mechanical motion is achieved by the wind coming from the blade. 12" Victor Lollipop oscillating vane fan (View 2) Here is the side view of the fan. Notice the three tab feet on the base and the gold pinstripping. I didn't notice the fan was about to fall off the deck with one foot hanging over until I came back in and looked at the pictures. I hate it when you drop your lollipop on the ground! 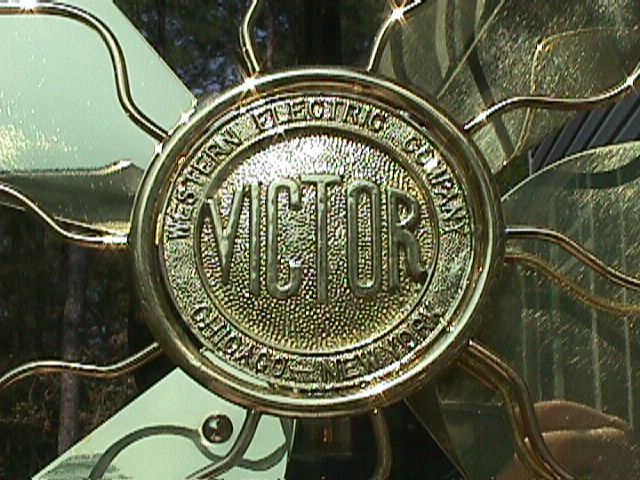 12" Victor Lollipop oscillating vane fan (View 3) This is the badge of the lollipop fan. 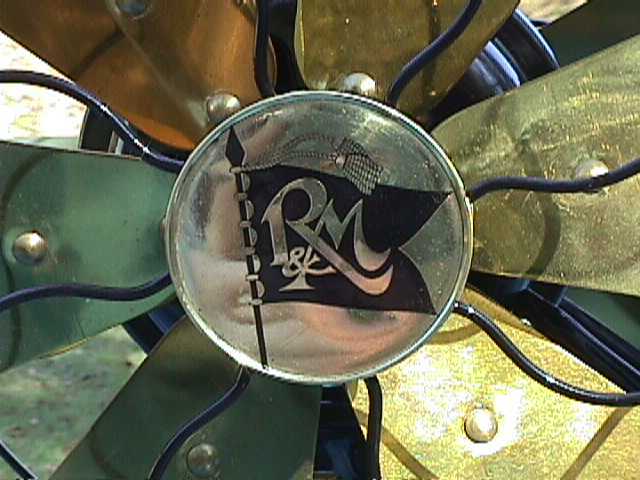 These lollipop fans were available with this badge or the R&M Standard flag badge. I like the Victor badge the best. The fans are otherwise identical. 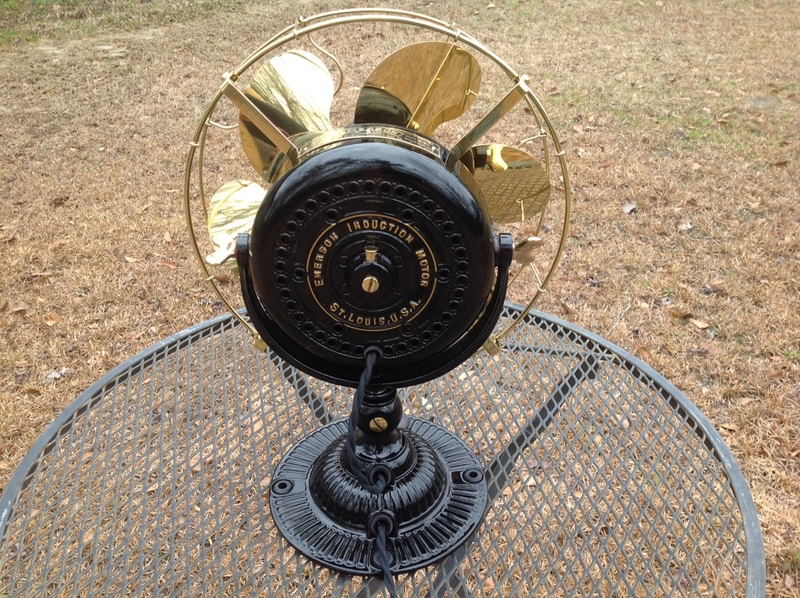 This is a 1904 Emerson 12" fan that I co-restored with fan collector friend Nick Loos. This fan was found about 850 miles from where I am located. The owner contacted me to see if I was interested in purchasing it, and it turned out it was only 9 blocks from Nick's house, so I asked Nick if he would pick it up and let's restore it together. Nick is one of the best blade and cage men in the business anyway so he did all of the brass work, cleaning/polishing, etc., and sent it to me. My friend Carlton Ward, one of the best painters in the country, did the paint, and I rewired, reinsulated the windings, made some miscellaneous parts and pieces including the switch lever insulating knob, screw-in grommets, new head wire, power cord, etc., etc. 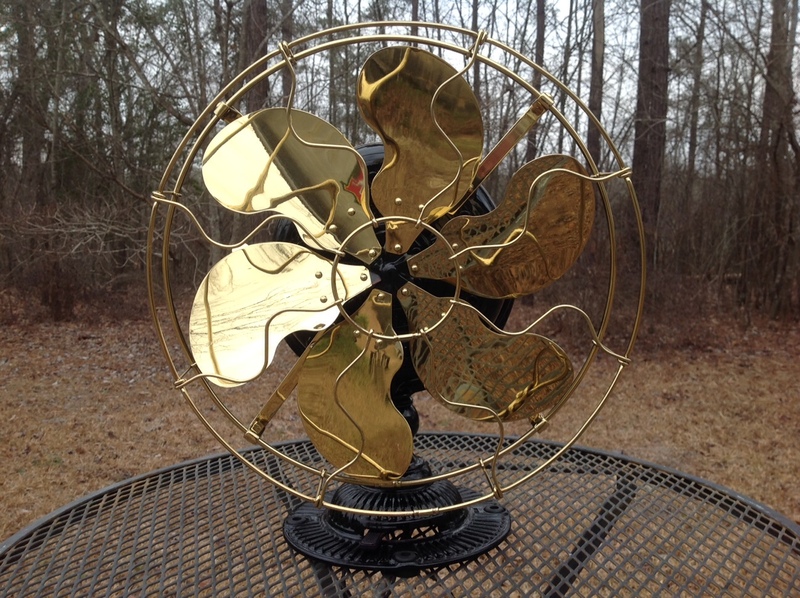 It turned out great and this fan will be on display, and For Sale, at our next annual antique fan show coming up in April. This fan has been sold. Here's a close up of some of the detail work at front/side view. Looking down onto top of the fan motor. Side view. 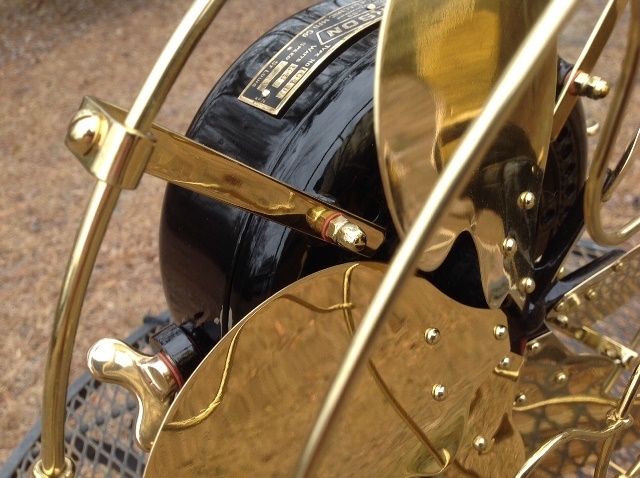 Notice the ornately ribbed "pie crust" cast iron base and large brass wing nuts that allows the motor to swivel up and down. Rear view. 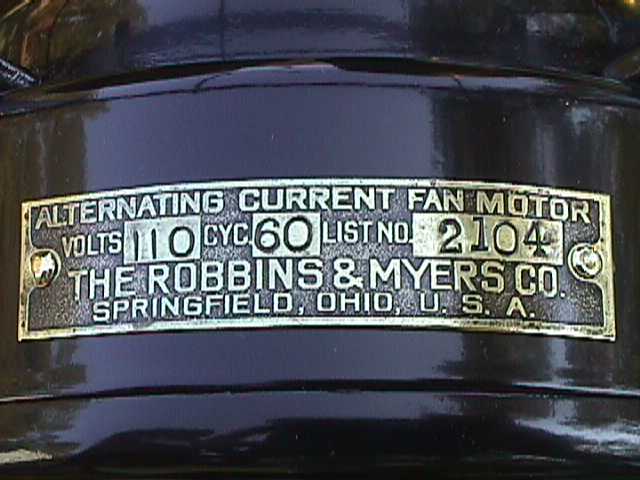 Notice the ornate motor castings and embossed Emerson Induction Motor, St. Louis, USA on the back of the motor. These motors have internal centrifugal starting switches and can run 24 hours a day without even getting warm if properly maintained. Lastly, a close up view of the base. 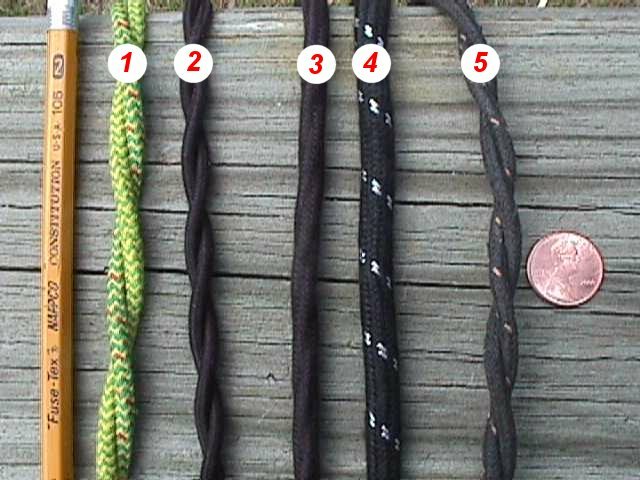 Below are 5 different types of cloth covered wire that was used on vintage fans for power cords and "head wires". The head wire is the short piece of wire that goes from the switch in the base to the motor windings. I have been fortunate to find plenty of this wire to use when restoring old fans. This type of wire is getting very difficult to find. Most wire companies today will not make this cloth braided wire anymore because it will not pass the Underwriter's Laboratory fire hazard test. 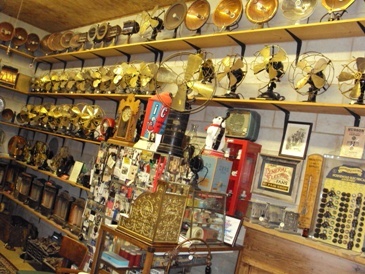 I used to be able to find NOS wire that had been fabricated years ago and had been sitting on a shelf somewhere in a warehouse, but myself and other fan collectors as well as radio collectors and toaster collectors have just about exhausted the supply. I have a source here in the USA that is willing to make a special run of cloth covered wire for me. The wire styles shown below (plus several other styles ) I generally have for those of you who may need some wire for your restoration needs. Please email or call for info. C&C Electric Motor Company of New York (front view) This is a very early electric fan made in the late 1880s by Crocker & Curtis. Some collectors refer to it as a "light socket" fan. It is a direct current fan. Found stored away and sealed up in a heavy wooden crate in an old barn, this proves that there are still good fans out there that have yet to surface. This fan motor is 100% original including the blade. C&C Electric Motor Company of New York (side view) Here is a side view of the C&C fan. 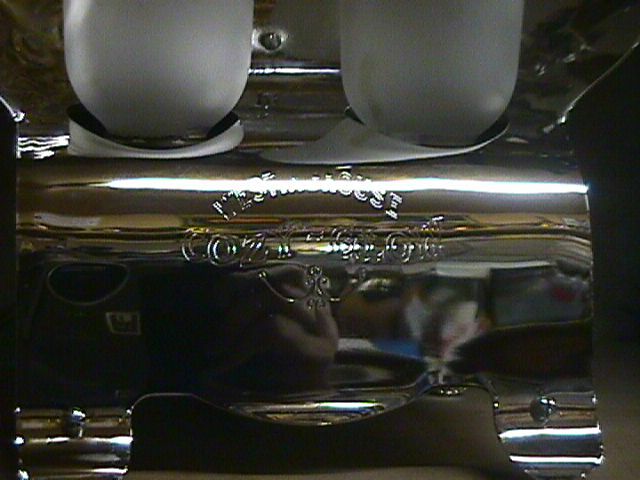 Notice the three claw feet and large nickel plated oilers that send lubrication to the bearings. C&C Electric Motor Company of New York (rear view) Check out the strips of copper that ride against the commutator. These are a primitive form of what is now referred to as brushes which are now usually carbon material. This fan has seen very little run time. The commutator and bearings have very little wear. C&C Electric Motor Company of New York (under power) After a little disassembly, cleaning, lubing, and reassembly, I applied power to the C&C motor for the first time in no telling how many years. She fired right up and ran just as sweetly as the day she was first assembled. Lake Breeze Model C Alcohol P.owered Fan (View 1) This is a Model C table top fan offered by The Lake Breeze Fan Company of Chicago, IL. 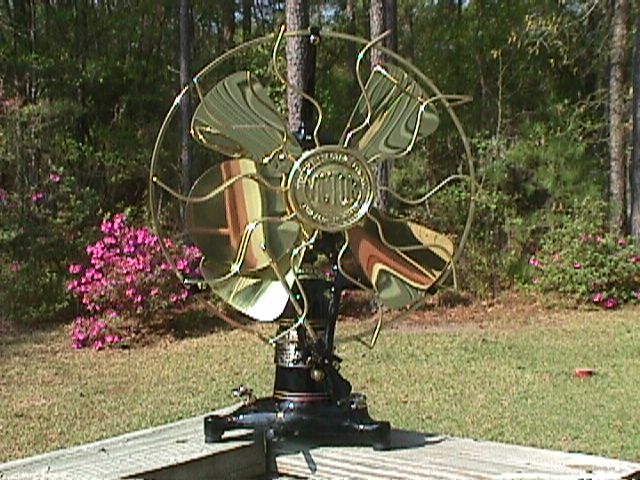 This fan is powered by a Sterling engine enclosed in the motor housing just behind the blade. 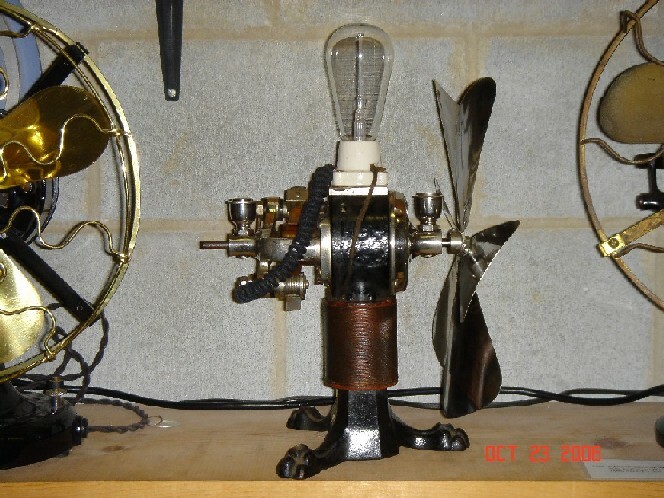 It has a small 2 cylinder motor and works by expansion and contraction of air. There is a compression piston and a displacer piston. Model A and Model B fans are scarce but are more commonly found than the Model C. In a 1915 catalog Lake Breeze illustrates a Model A, B, C, and D. I have never seen a model D. Very few Model C fans were sold and probably even fewer Model D fans were sold. Lake Breeze Model C Alcohol Powered Fan (View 2) This view shows the fan from the back side. You can see the motor housing where the crankshaft and piston rods are located. 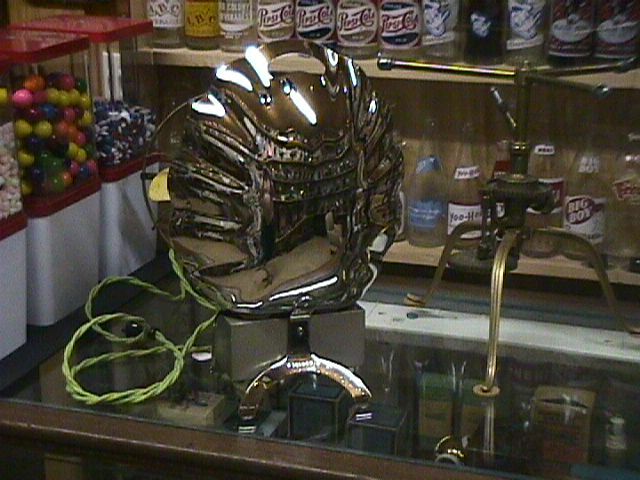 Also notice the fancy wrought iron stand and alcohol burner at the bottom of the stand. This fan has a blade span of 16". Lake Breeze Model C Alcohol Powered Fan (View 3) Take a look inside the motor housing. Here you can see the crankshaft and roller bearings. Below (out of view) are the pistons which are located in the neck section of the fan. Lake Breeze Model C Alcohol Powered Fan (View 4) This is the alcohol burner that fits inside the stand at table level. 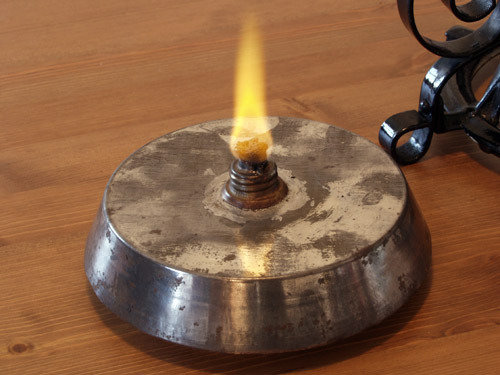 Heat from this burner causes air to expand thereby causing compression on the piston above. 16" Westinghouse Tank Motor 6 Blade Fan The Westinghouse Tank motor was produced around 1906 - 1910 and many survive today, but most are the 4 blade models. 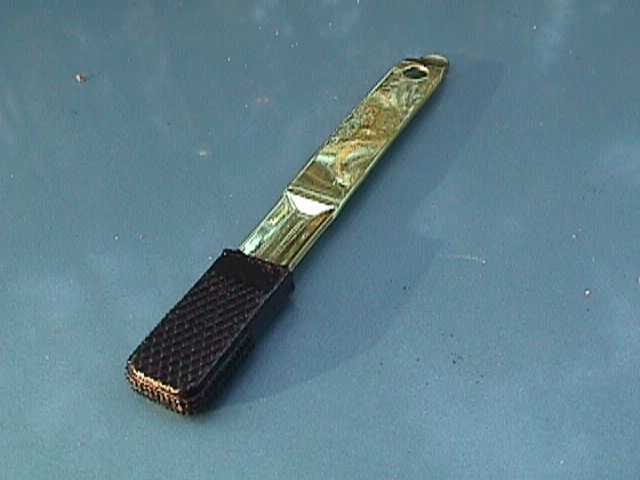 The 6 bladed models are more uncommon, especially in a 16" size. 16" Westinghouse Tank Motor 6 Blade Fan (another view) I found this fan in an old building in Montana. 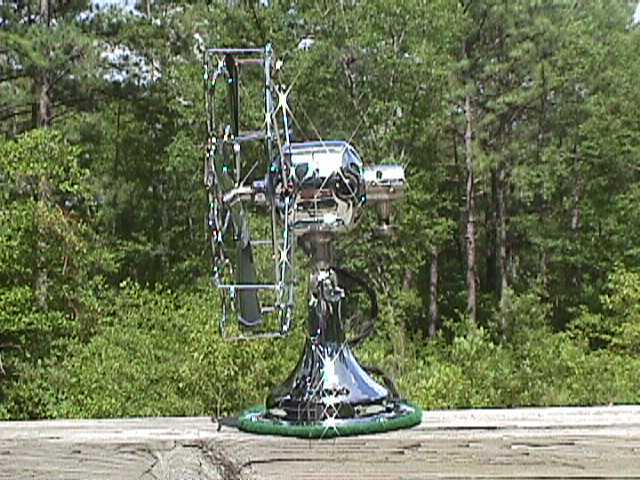 The motor retains it's original finish but I did have to repaint the base. c.1919 R&M Partners Desk Fan (View 1) This is what is known among collectors as a partners desk fan or a double head fan. You've seen the Partners Desks where two people sit at the same desk facing each other and each have a set of drawers that pull open from his own side. 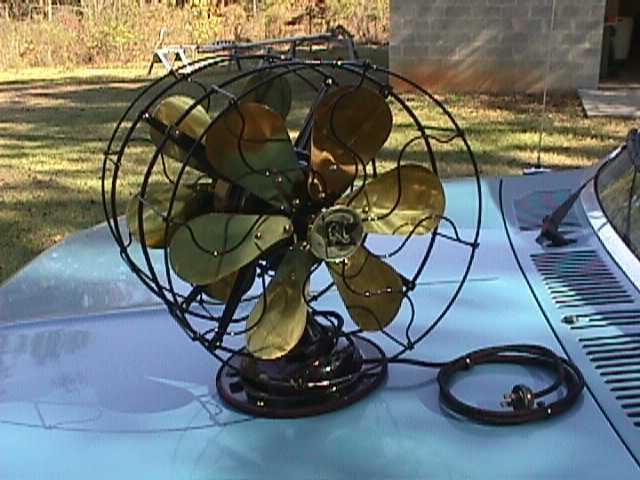 Well this is a fan that would sit in the center of the desk and cool each occupant. Cool! 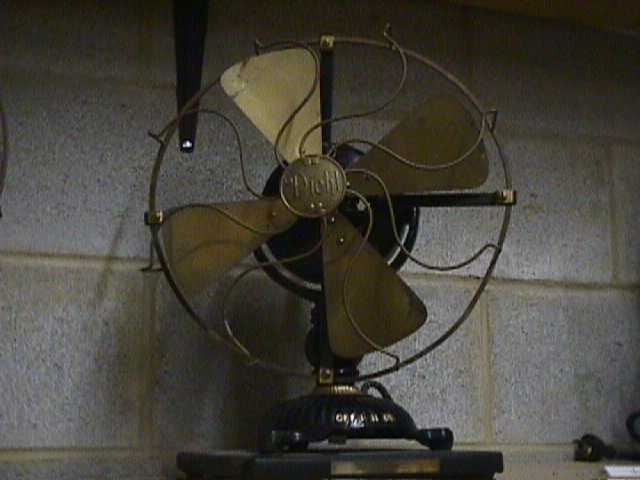 c.1919 R&M Partners Desk Fan (View 2) This is another of the 6 blade variety (well 12 blade in this case). 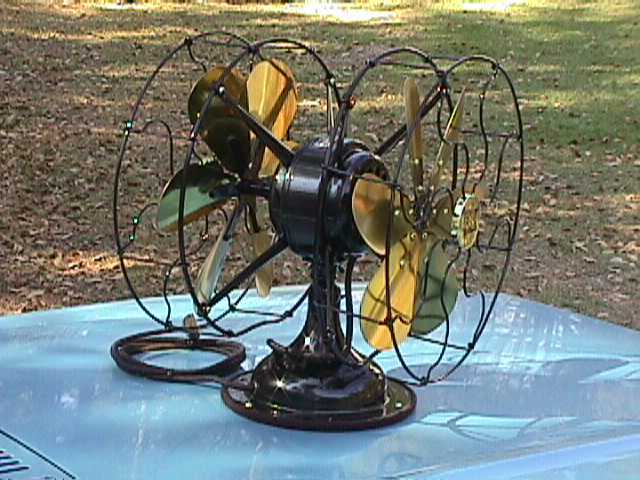 The 6 blade fans were introduced and commonly called "residential fans" in those days. 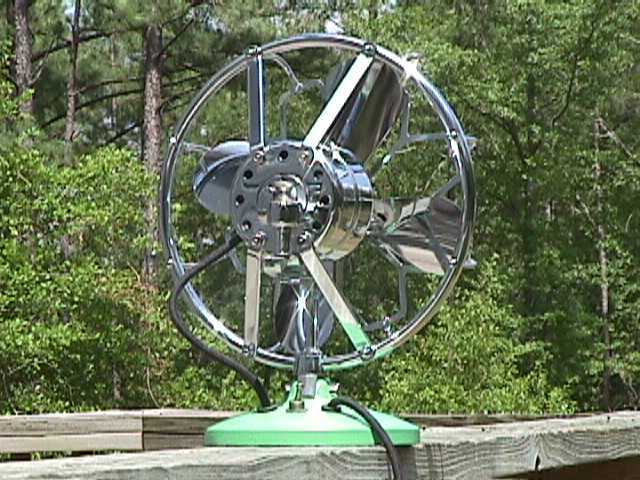 The six blade residential fan motors did not turn as many rpms as their four bladed counterparts yet moved the same amount of air due to having more blades. This was pleasing to home owners who liked to sleep under the cool breezes of a fan because these fans did not make much noise when running. c.1919 R&M Partners Desk Fan (View 3) I found this fan in Knoxville, Tennessee. It ran but had been neglected and was very rusty. It needed much cleaning and called out for fresh paint. I restored this one in 1997.
c.1919 R&M Partners Desk Fan (View 4) Here you can see the lettering I painted on by hand at the switch. Also notice the finish on the base. I applied six coats of gloss black lacquer, sanding between each application and baking each application at 175 degrees. When restoring fans it is especially important that the humidity be below 70%. Here in South Carolina it's tough to get a good day to paint in the summertime because humidity levels typically run 80% to 100% on a daily basis. Baking the freshly applied finish in an oven helps but does not always cure all of the problems associated with too much humidity. c.1919 R&M Partners Desk Fan (View 5) a nice side view. c.1919 R&M Partners Desk Fan (View 6) Here is the motor tag in it's original merely polished condition. Above is a Hamilton Beach fan motor. These are fairly scarce. This particular example has a Western Electric motor tag making it that much more scarcer than the examples with the normal Hamilton Beach tag. 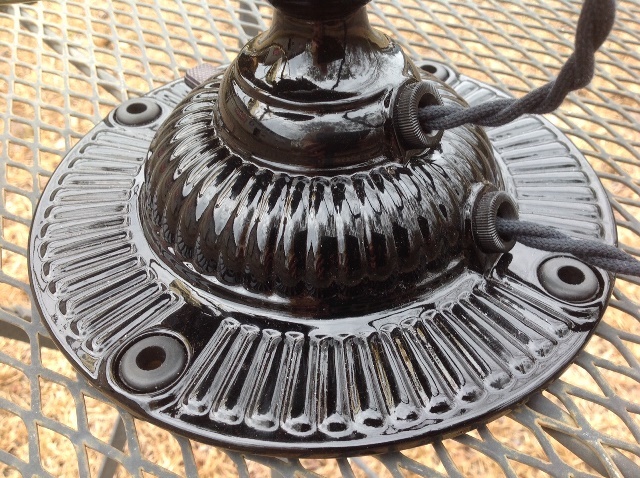 I restored this fan and replated all parts that were plated originally. It's a nice looking fan, especially from the side view. I like the way the blade and cage hangs way out front. Notice the blade has a very deep pitch to it. The square cast iron base is attractive too. I'll show this fan's side view below. This is the side view I mentioned above. Cool looking isn't it! This is the motor tag. 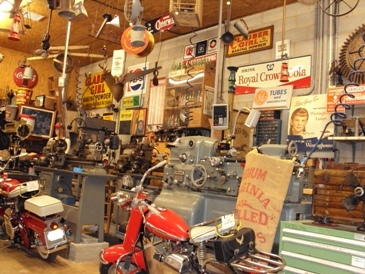 Most of these examples have a regular Hamilton Beach motor tag. 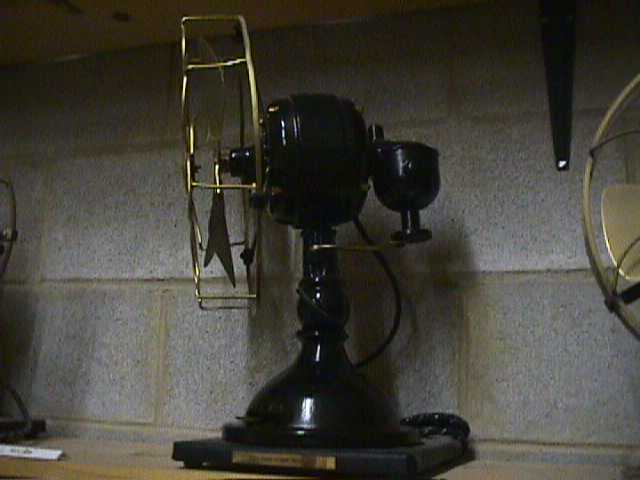 This example was made and sold to Western Electric for them to market. 1906 Diehl (Ornate Base) Fan This is a nice original example of an ornate tab base Diehl Universal 12" fan. It retains it's original black japan finish as well as gold pinstripping and switch lettering. This is exactly how I found it. I have not even cleaned it. 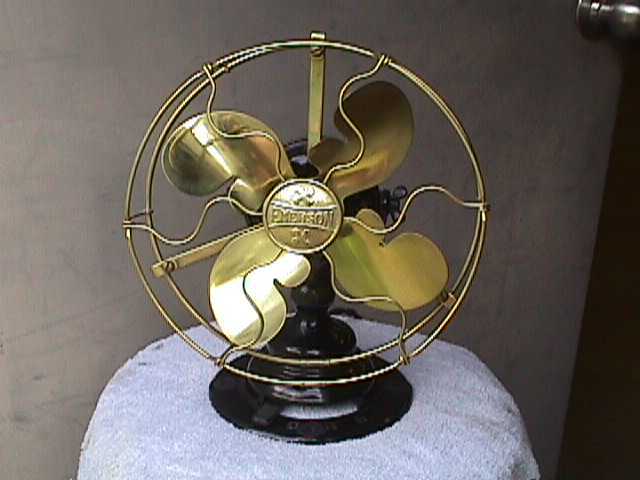 c.1910 Diehl Toilet Bowl Oscillating Fan This is what is referred to among collectors as a "toilet bowl oscillator". The gearbox on the back of the motor housing is shaped somewhat like a toilet bowl and is a clamp on gearbox. The fan is very massive and heavy. 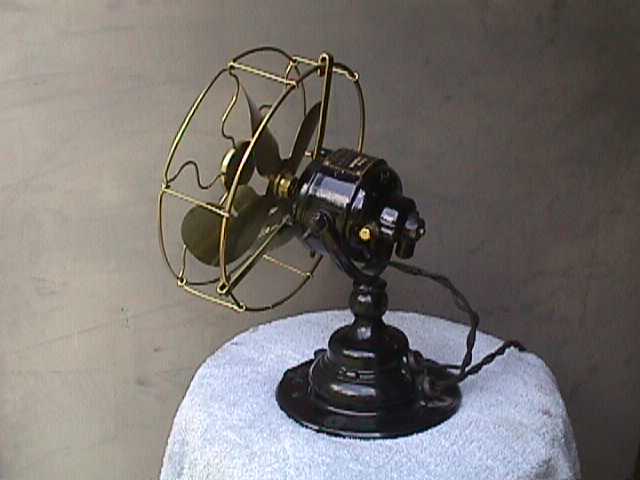 It has a triangular porcelain switch in the base and a brass switch lever with cross hatching on the end of the lever where most fans used a black bakelite knob. 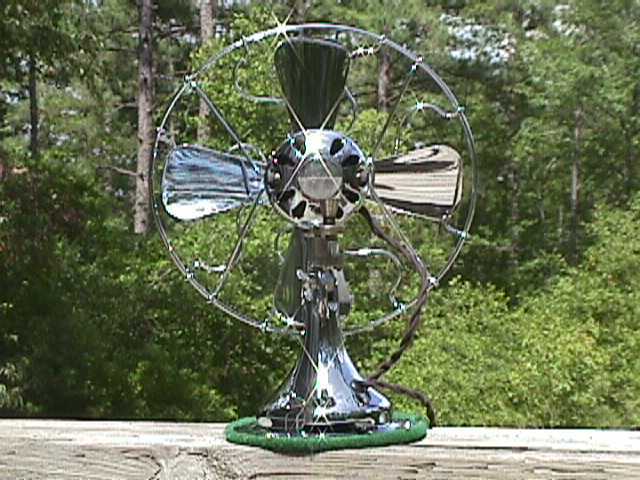 This is a very attractive fan. I restored this one in 1993. 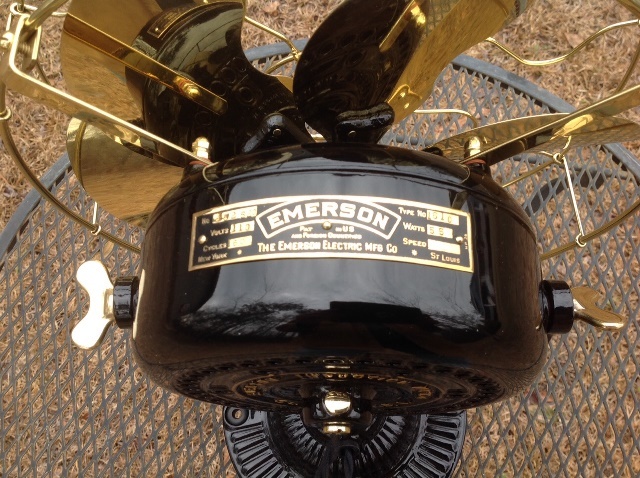 Emerson 19044 DC Current Fan (View 1) The use of the word "rare" when referring to collectibles is, more often than not, misused. However, I think this fan falls into the rare or at least "scarce" category. 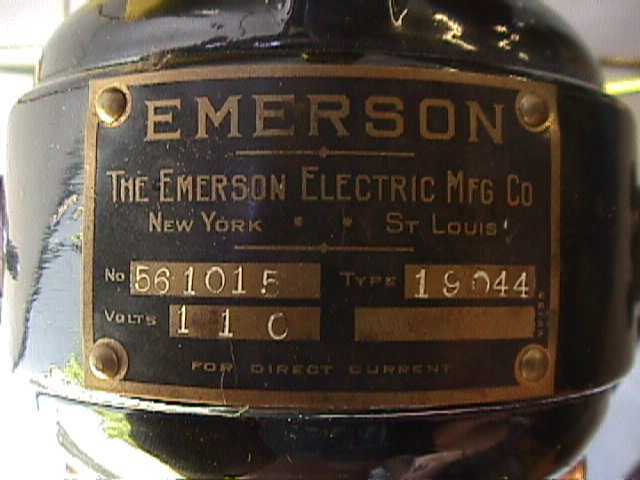 There are only three known examples of the Emerson 19044. 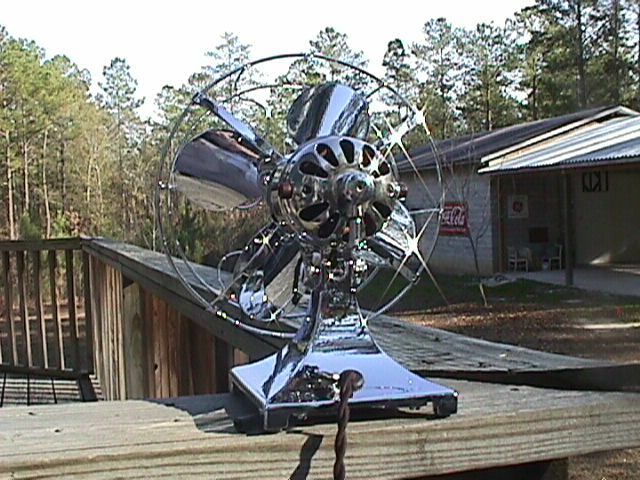 This is an 8" yoke mount fan with a "bullwinkle" one piece blade and operates on 110 V DC. 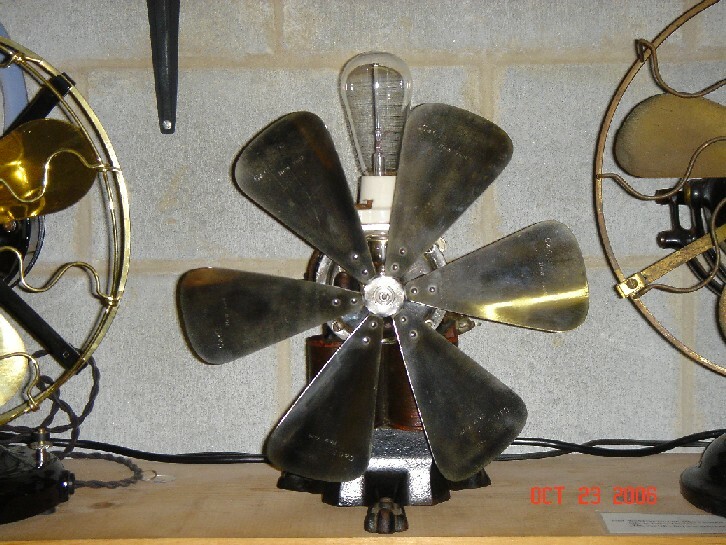 Most examples of this fan are the alternating current type, designated as Type 19644, and are fairly common. This one however, operates on direct current only and is designated Type 19044. Emerson 19044 DC Current Fan (View 2) Notice the small compact motor. 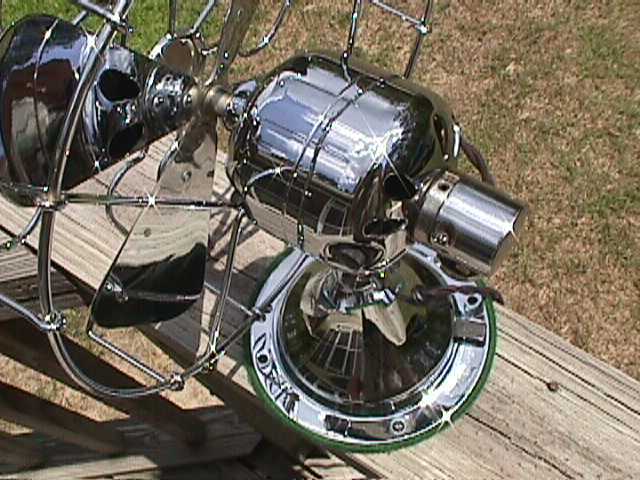 This fan retains it's original finish on the motor but I did have to repaint the base due to a lot of paint flaking and chipping around the edge of the base. The paint matches very nicely I think! Manhattan Electric Supply Company (MESCO) Ball Motor DC Fan (View 1) This is an early 12" ball motor fan that runs on 110 V DC current. A nice example with it's original finish. 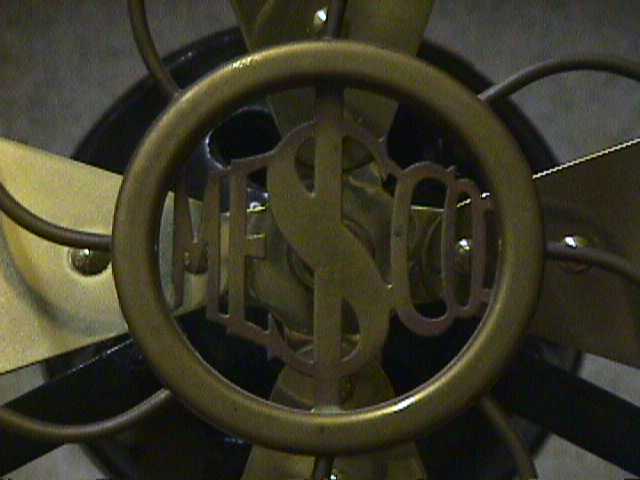 Manhattan Electric Supply Company (MESCO) Ball Motor DC Fan (View 2) The stencil cut out badge with $Dollar Sign$ logo in the center is one of the most attractive of all fan badges. 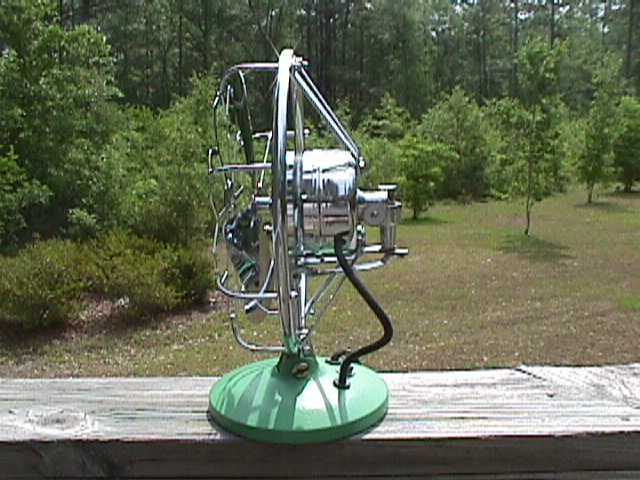 Gilbert Art Deco Aristocrat (View 1) Here is a chrome Aristocrat model manufactured by A.C. Gilbert, the erector set people. 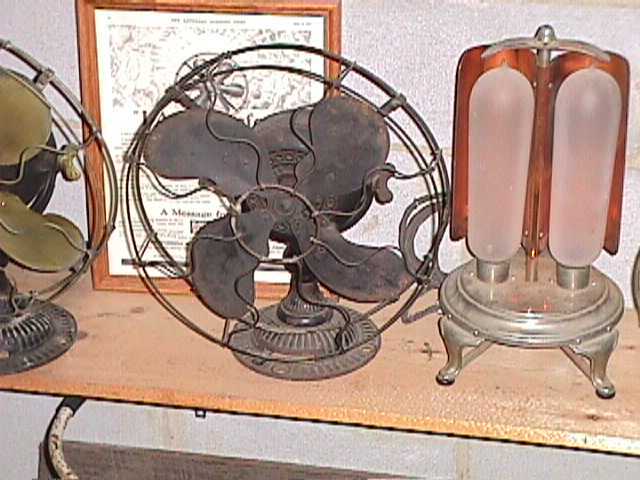 This fan dates from about 1934. I restored this one in 1996. 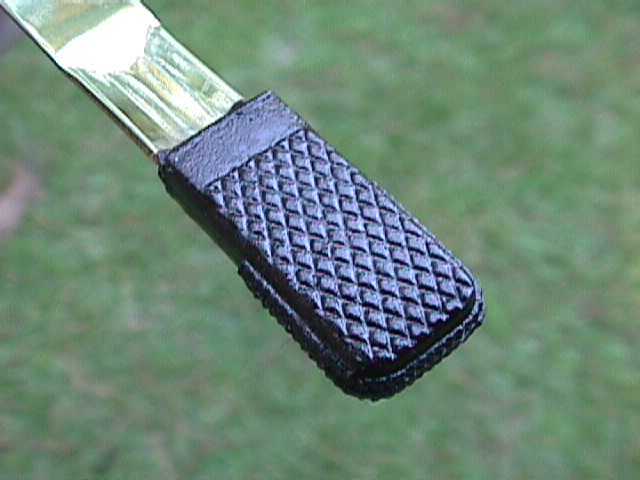 These were available in two different finishes; the green base with green background in the badge as seen here, and the more commonly found black wrinkle finish model. Gilbert Art Deco Aristocrat (View 2) This is the Gilbert chrome Aristocrat as seen from the back view. Gilbert Art Deco Aristocrat (View 3) Side view of the Gilbert Aristocrat. 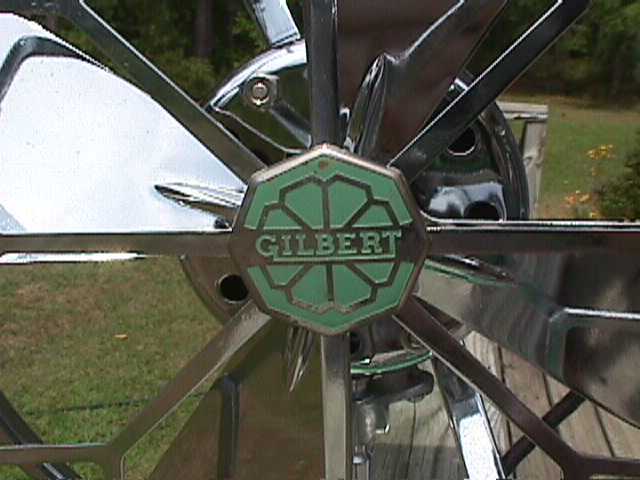 Gilbert Art Deco Aristocrat (View 4) Close up of the badge of the Gilbert Aristocrat. The other model that was available had a black background in the badge. 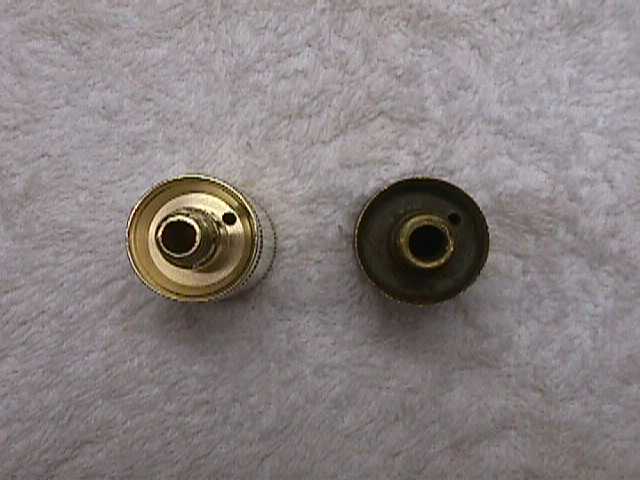 Below are replacement heater elements for the copper dish type heaters. Some are NOS having never been used and still in the original box. These elements are getting much more difficult to find. Let me know if you need a replacement element for your heater. There are the cone style and straight cylindrical shape. General Electric 3 Bulb Heater I also collect early electric heaters. 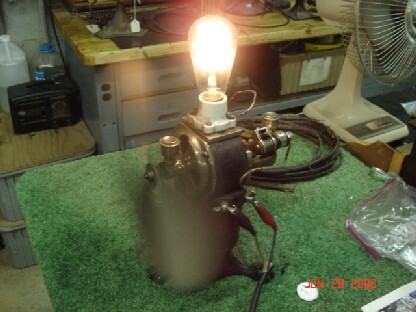 Here is an example of an early 3 bulb model by GE. The bulbs have a patent date of 1903 but I think this heater is a little closer to 1910. General Electric 3 bulb Round Top Heater This is an example of the round top version Luminous Heater that was offered by G.E. I assume this model is earlier than the flat top model shown above, and probably was not made in as many quantities as the flat top example, since these round tops are rarely seen. I only know of 3 or 4 of them in existence, but the flat top version often shows up at flea markets, antique shops, and internet auctions. General Electric 2 Bulb Heater This is a simpler and more affordable example than the 3 bulb model. There is no switch. It is a "plug-in" heater and both bulbs burn when the heater is plugged in. 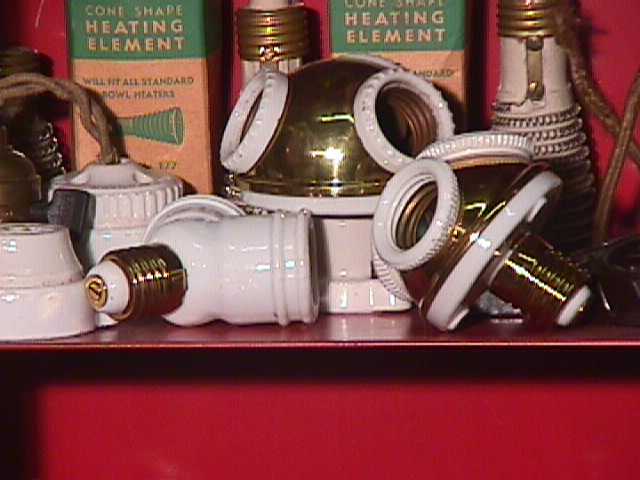 The 3 bulb model has a switch that allows the user to heat with only one, two, or all three bulbs. 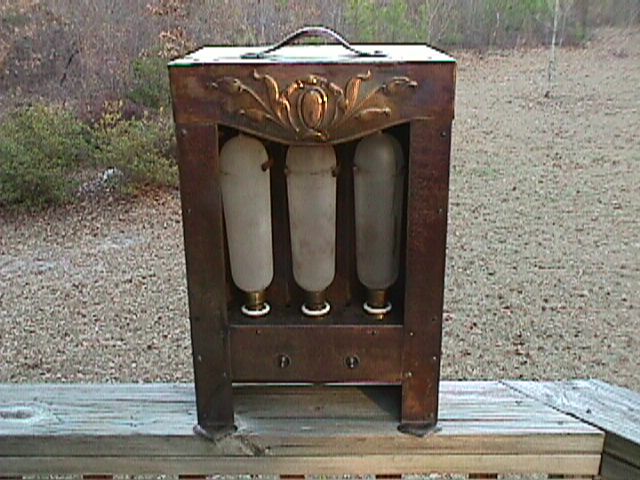 National Electric Heating Company 3 Bulb Clawfoot Heater (View 1) This three bulb heater is very ornate and heavy (cast iron). It was purchased from a dealer in Canada. I estimate this heater to be from the 1900 to 1910 period. Anyone who may have information on this company please contact me and I will be glad to listen. Also I would like any literature or printed information that may be available. National Electric Heating Company 3 Bulb Clawfoot Heater (View 2) This view shows the cut out vents of the top section of the heater just a bit better than the previous view. This is probably my most favorite of all of the bulb heaters. The claw feet are just awesome as well as all of the other intricate details of this item. I would really like to find out more about this company and other models that may have been available. Westinghouse 2 Bulb Cozy Glow Shell Shaped Reflector Heater (View 1) This is a rarely seen 2 bulb heater offered by Westinghouse Electric. 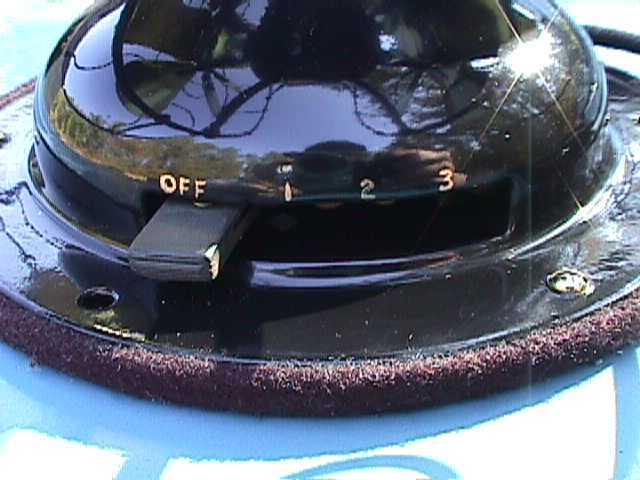 The entire base and reflector shield is nickel plated. A very attractive heater indeed. Westinghouse 2 Bulb Cozy Glow Shell Shaped Reflector Heater (View 2) This is the back side of the heater shown above. Very beautiful. Westinghouse 2 Bulb Cozy Glow Shell Shaped Reflector Heater (View 3) This view shows the front base section of the heater. The Westinghouse company name is engraved into the base with the words "Cozy Glow". 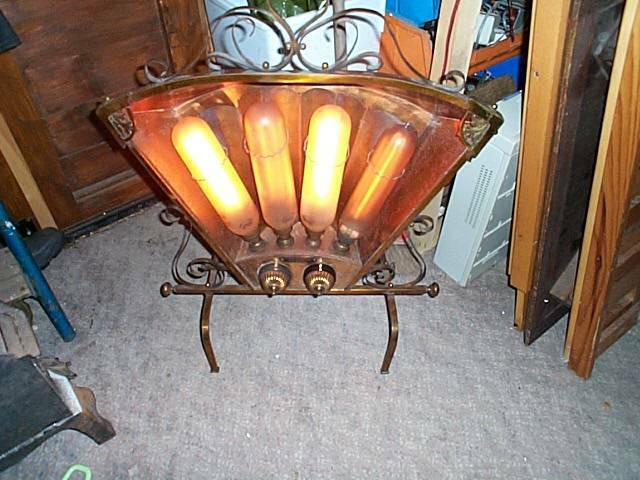 3 Bulb Hammered Copper Heater (View 1) I recently acquired this heater but it has no manufacturer's name on it. The entire case is made of hammered copper and has a nice patina. I have examined the switches, sockets, and wiring and have determined that this heater is probably from the 1910 period. 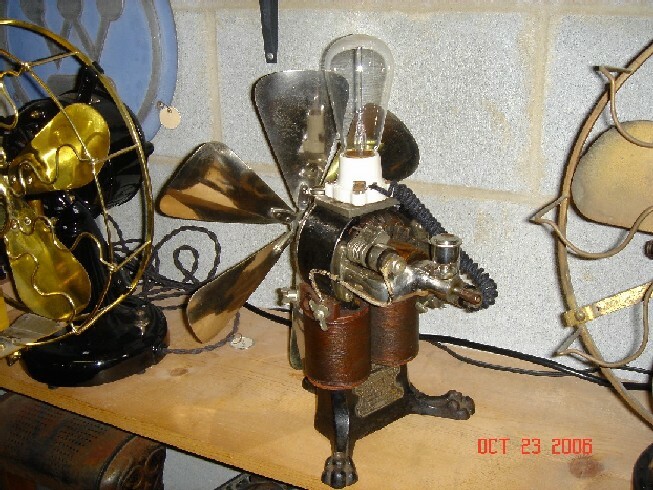 It appears to be factory made but I see no evidence of it ever having a manufacturer's tag referencing voltage, model number, or location of the maker. 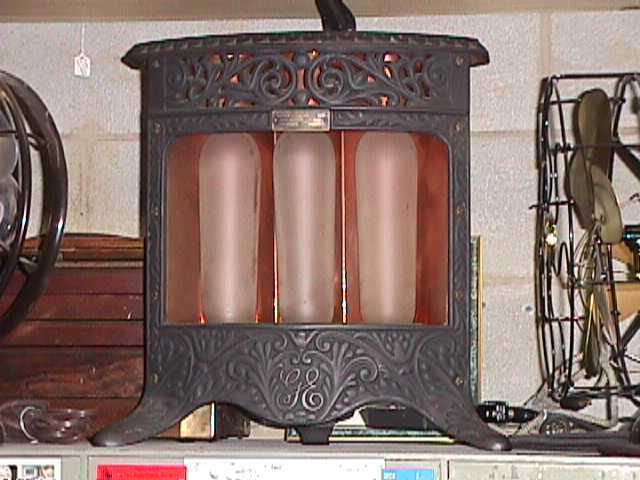 This is the only example I have ever seen of this type heater. Notice it has three bulbs but only two switches. 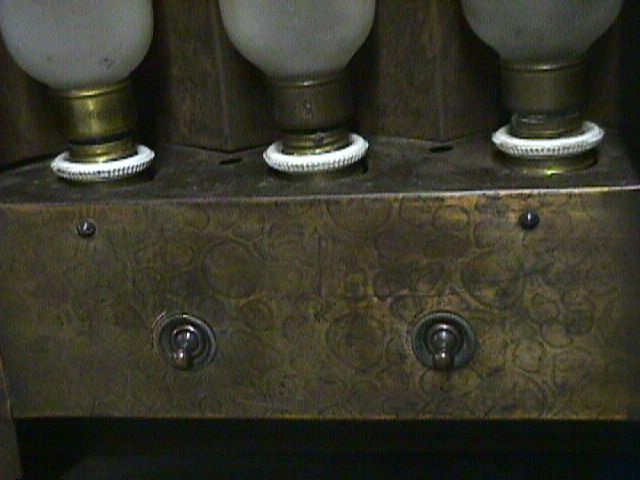 The left switch operates the center bulb and the right switch operates the two outer bulbs. 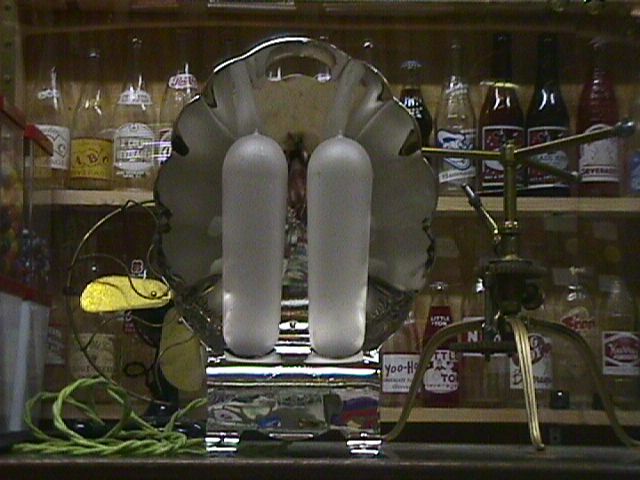 With this combination the operator can burn one, two, or all three bulbs, which ever is desired. This unit is wired both series and parallel to achive this combination. 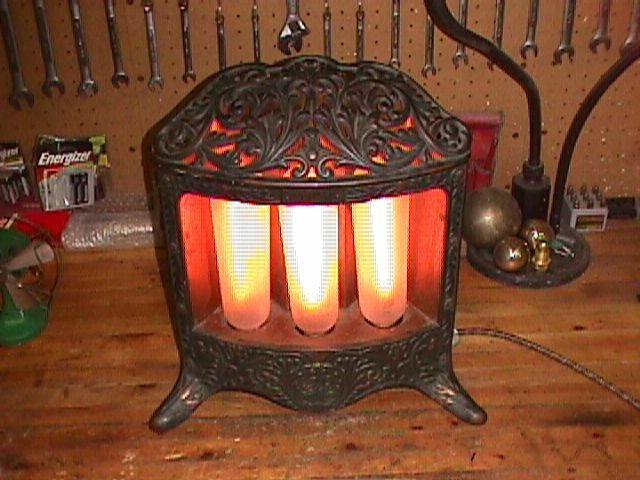 3 Bulb Hammered Copper Heater (View 2) This is a closer view of the front of the heater. Notice the finish. I'd like to know how this finish was applied. I'm guessing it was done chemically or with heat. This is a smooth texture but there are areas that are "hammered" on the heater. See next view of this heater for a closer look at the hammered feature. 3 Bulb Hammered Copper Heater (View 3) This is the handle which is located on top of the heater. Notice the hammered copper. The feet of this heater are also hammered. 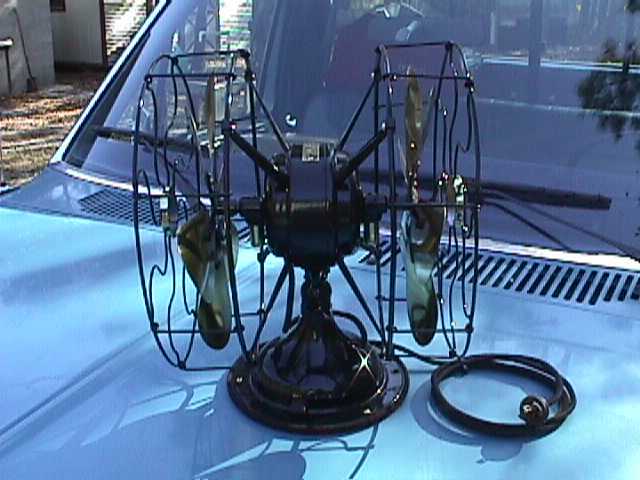 4 Bulb Dowsing Heater with Fan Shaped Reflector This heater was made in England. It is very ornate and rare. 3 Bulb American Heater This is one of my favorite bulb type heaters. I like the ornate castings and the overall look of this heater. These are rather difficult to find. 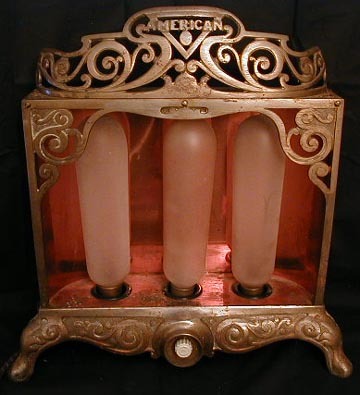 I must see at least a dozen of the General Electric 3 bulb heaters for every one of the American heaters. I was glad to be able to add this one to the collection and be the caretaker of it for a while. One can also find these same exact heaters with the word "Detroit" at the top rather than "American". 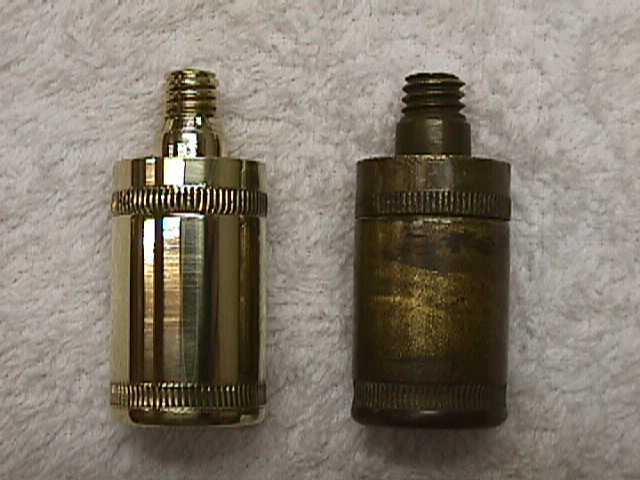 General Electric Pancake Oilers (View 1) Here on the right you will see an original (tarnished) brass oiler for a GE Pancake fan. 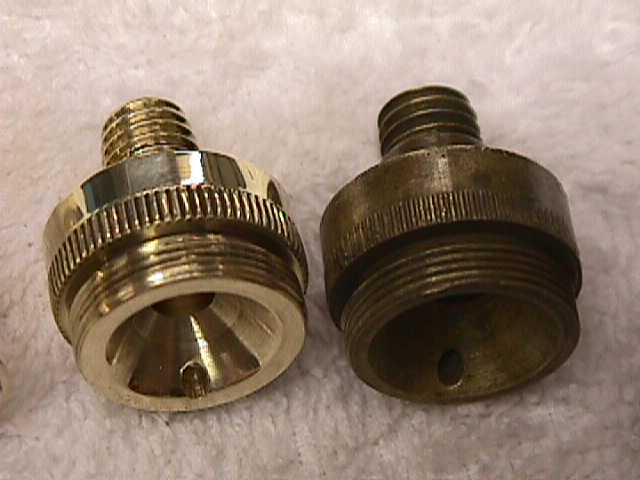 The oiler on the left is one that I made using the original as a "pattern". 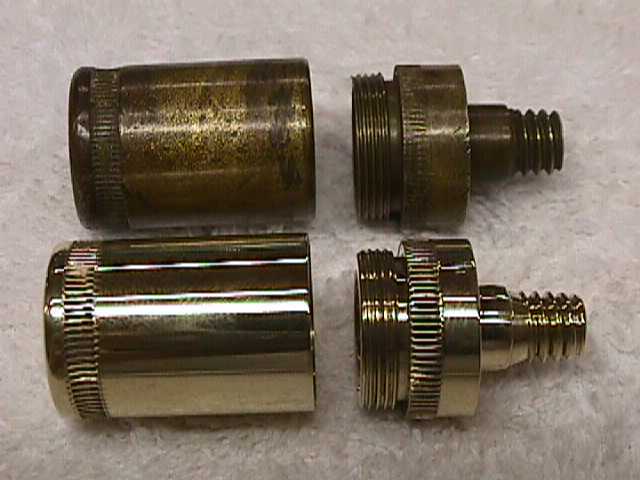 I carefully measure each attribute of the original oiler and draw a blueprint of it, then go to the lathe with a piece of brass stock and machine away everything that doesn't look like the original to make a perfect reproduction. Compare the two side by side. General Electric Pancake Oilers (View 2) The top oiler is an original. Here you can see the detail of each section. General Electric Pancake Oiler (View 3) Again the original oiler on the right and the one I made on the left. 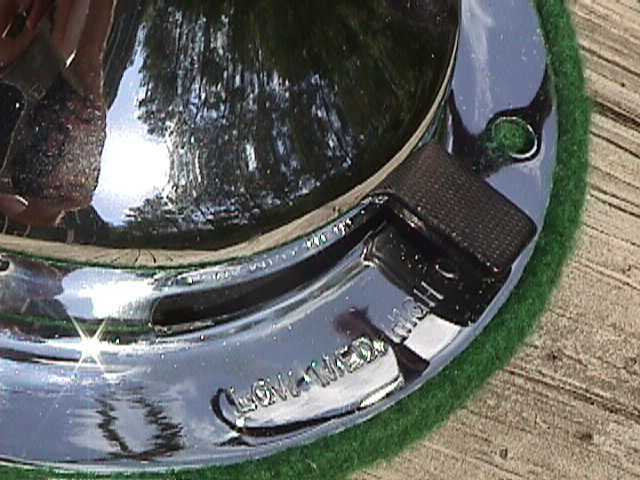 Here you can see the oil tray in the top of the oiler with the oil return hole in the bottom to allow oil to return to the cup. General Electric Pancake Oiler (View 4) Compare detail. General Electric Pancake Oiler (View 5) Here you can see the detail inside the top section. 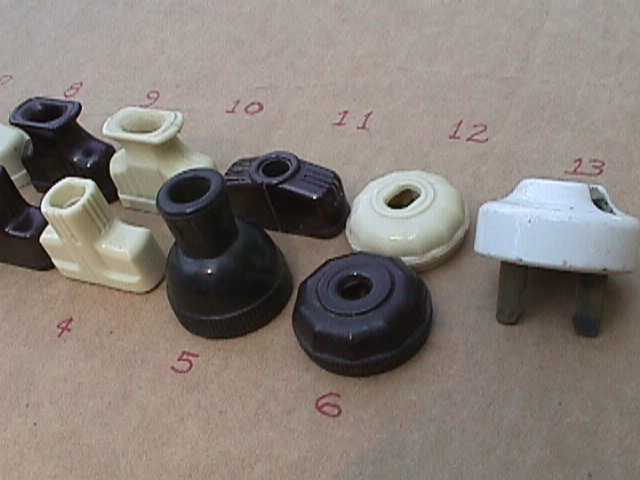 Replacement Knobs for Emerson Switch Levers (View 1) The original black insulating knobs on the end of Emerson switch levers were made of bakelite and often became brittle. Many Emerson fans are found with the knob broken or missing altogether. I had several fans that needed knobs so I made a mold to reproduce them. 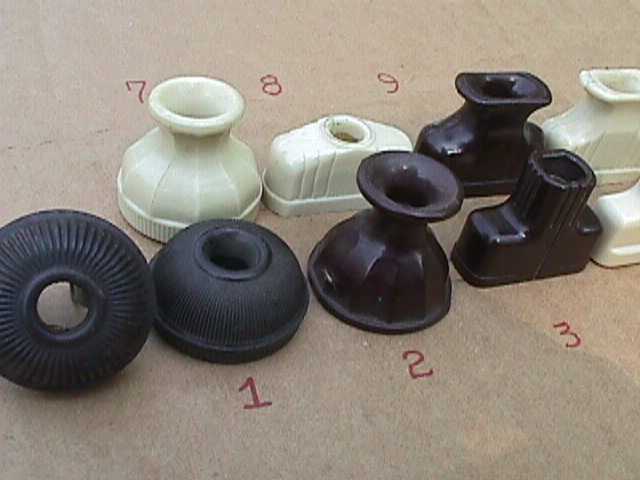 These reproduction knobs are molded onto the levers just the way Emerson did it so that they will not pull off. Replacement Knobs for Emerson Switch Levers (View 2) Unlike GE or Westinghouse fans, the Emerson switch knobs have a decorative "cut" to them. GE Pancake Terminal Insulators These are insulators for the exposed terminal lugs on the back of GE Pancake fans. 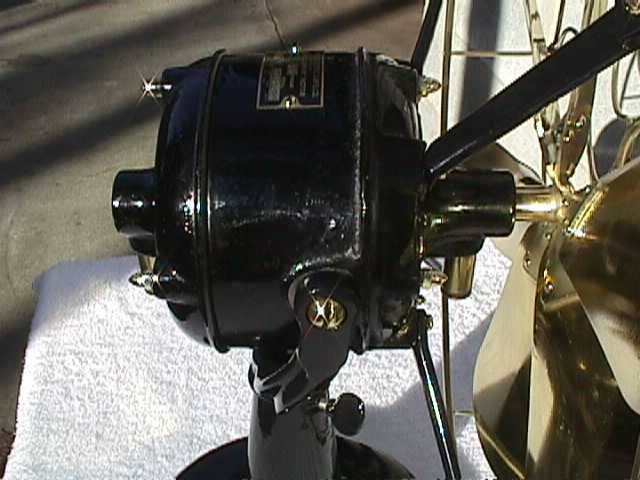 Refer to the link to the 1900 GE pancake fan above to see the exposed brass terminal lugs on the back of the motor. These pieces keep the current from shorting out against the fan motor housing. 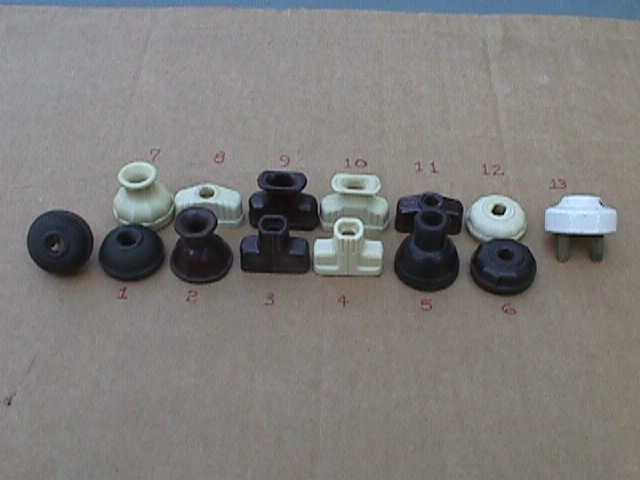 Attaching Plugs and Wire Clusters Here are some early attaching plugs and wire clusters that were used around the turn of the century for use in connecting early appliances such as fans, heaters, toasters, irons, etc to standard house current. Years ago when houses were first wired for electricity there was usually only one "drop" in each room, and it was usually in the middle of the room. 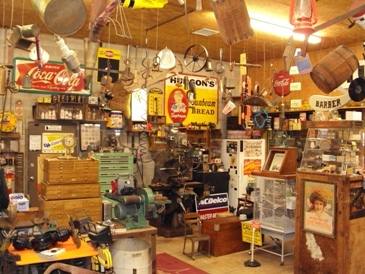 A single light socket would hang down from the ceiling to about 5 or 6 feet off the floor. This is where the home owner could screw in a light bulb to have light in the room or screw in an attaching plug to run a fan or some other appliance. Okay, I know you see the problem here. This wasn't even as luxurious as Oliver and Lisa had it on the TV show "Green Acres"! If you wanted to run the fan you had to unscrew the light bulb, then you were in the dark. This is where the wire clusters came into play. They allowed a light bulb and a fan to be plugged in a single light socket at the same time. We have a similar item today some of us refer to as a 3 to 1 plug. Wire clusters came in 2 to 1 models, 3 to 1, 4 to 1, 5 to 1, and I am told there were as many as 12 to 1 wire clusters. I bet you couldn't run many of those old copper dish heaters on one wire cluster or else it would be like the Green Acres episode..... "Count the amps Lisa!" More Wire Clusters Here's a few more wire clusters and miscellaneous plugs and things. Vintage Plugs (12 different styles) Here are some of the different styles of old vintage plugs (not repros) that I have collected. 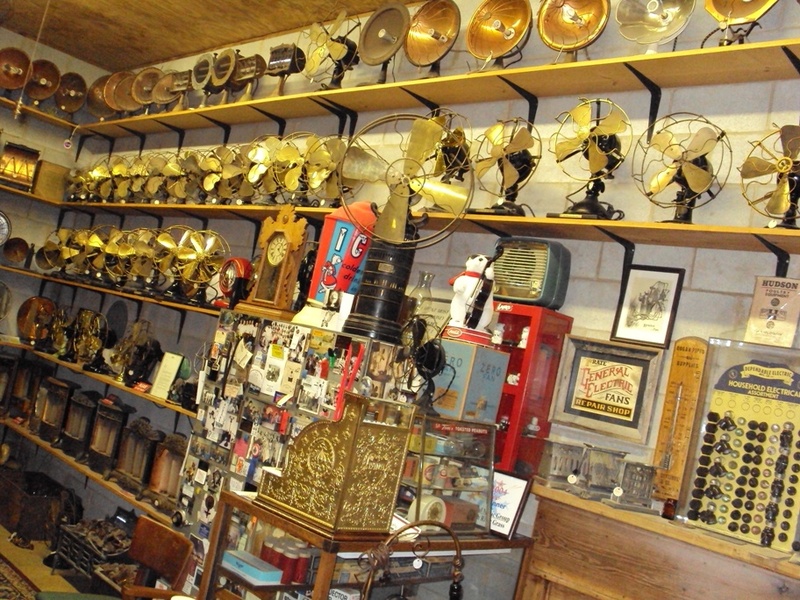 Each one is authentic and correct for a certain era and type of fan or other electrical device. 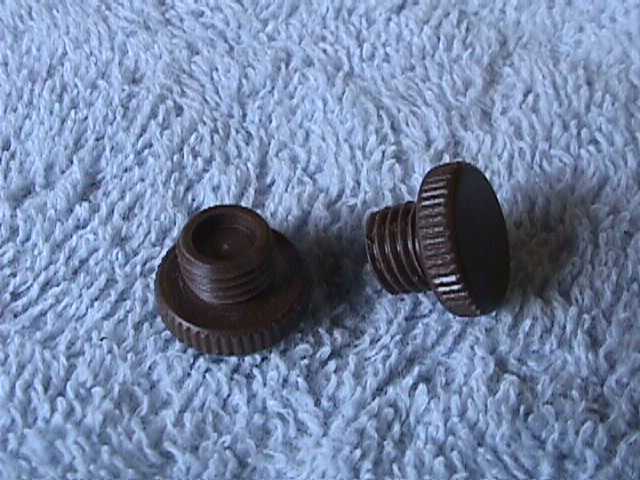 I have collected about twelve half-gallon containers full of these old plugs. The right plug for the right fan I always say! 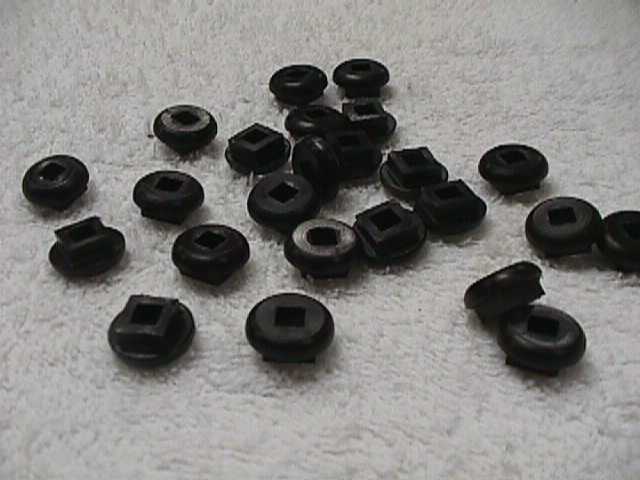 Vintage Plugs (close up View1) Here is a close up photo of the black bakelite half spherical plugs I refer to as #VP01. 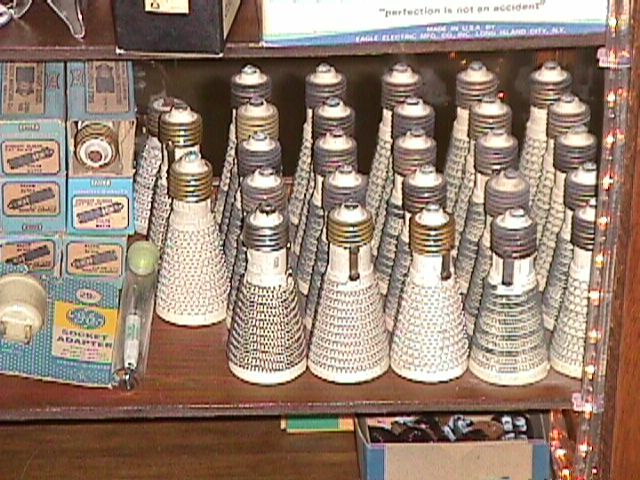 Vintage Plugs (close up View 2) Here is a close up photo of several other type plugs used on vintage fans, heaters, lamps, toasters, etc, etc. 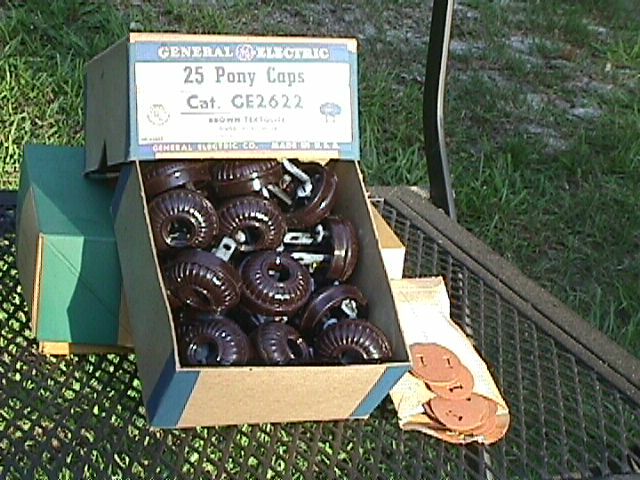 Above is a box of NOS bakelite plugs by General Electric with the insulators also in the box. I got lucky and found quite a few of these boxes of plugs. 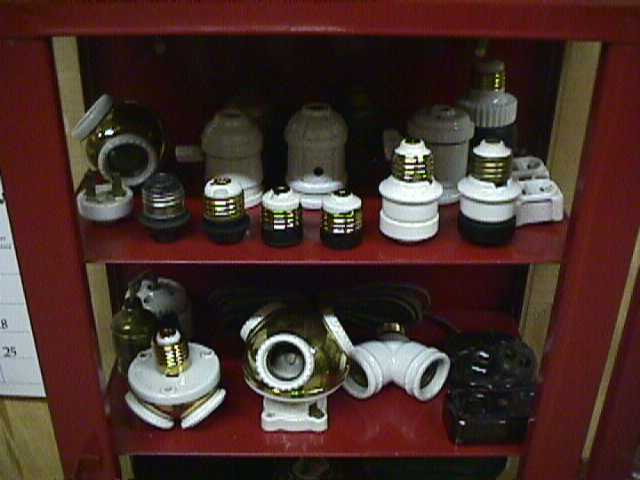 They are New Old Stock (NOS) meaning they are old vintage plugs that were never used. 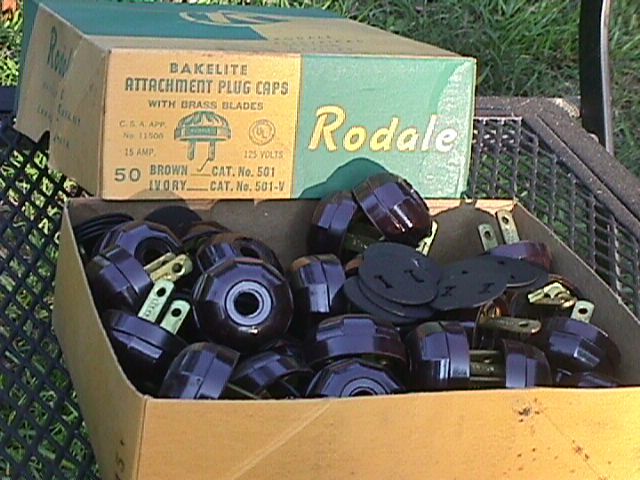 Below is a box of NOS Rodale plugs from the same period. I have plenty of these plugs if anybody needs them. 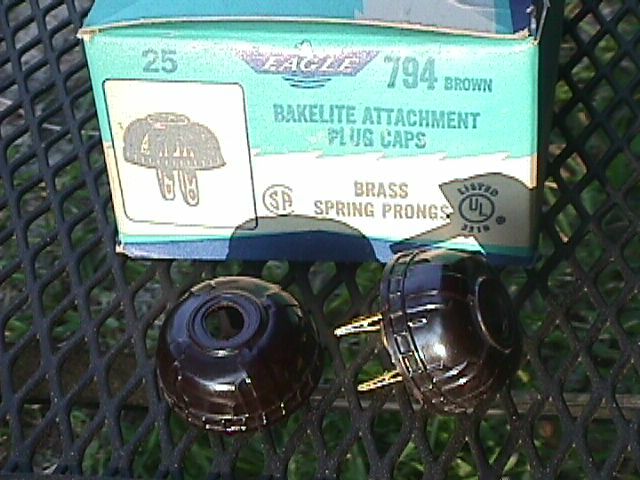 Below is another box of Eagle brand vintage bakelite plugs. NOS plugs are a treat to find! 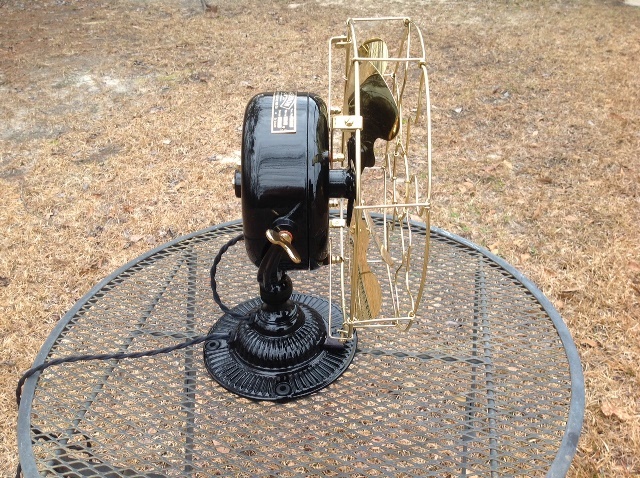 The Eagle brand plugs are quite deco in style and look great on old radios as well as old fans. Westinghouse Floor Column Gyro Fan Here is a rare model of the gyro fan offered by Westinghouse about 1915. 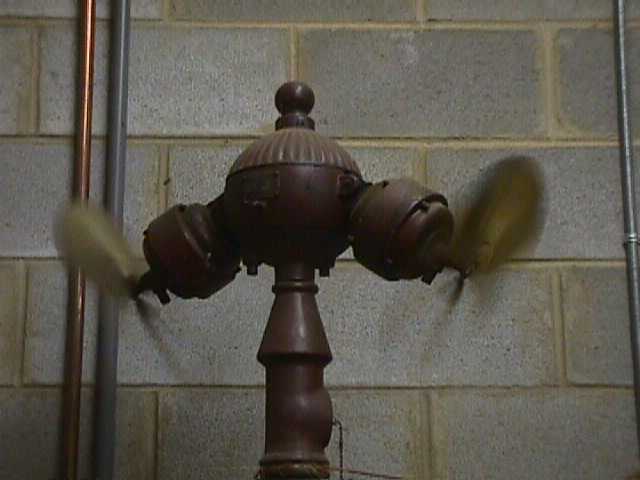 There are two seperate fan motors atop a cast iron and brass pole that stands about nine feet tall. These two motors gyrate or spin around in a circle atop this pole hence the name "gyro" fan. These are more commonly found in the type that hang from the ceiling. The floor column models are very rare. This photo was taken with the fans in motion. I someday hope to get this one restored. It is in "as found" condition at this time. 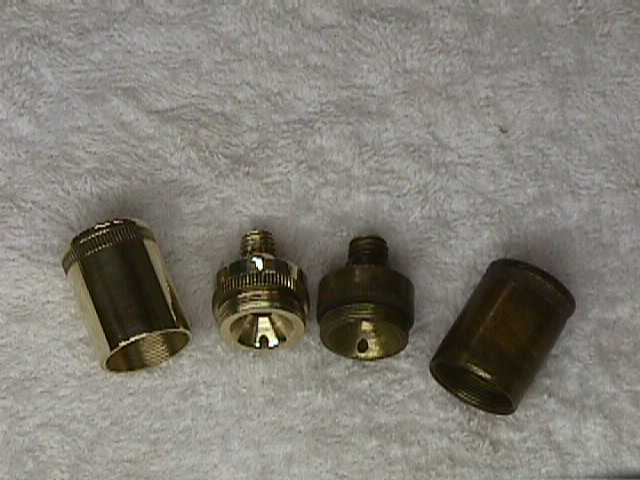 Westinghouse Gyro and All Brass Brush Caps Here is a sample of a pair of brush caps that I reproduce for the Westinghouse all brass and gyro fans. 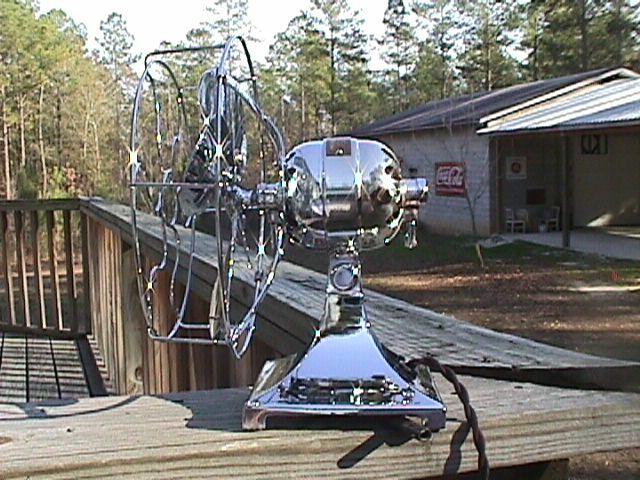 c.1918 Fitzgerald Star-Rite All Chrome 10" Oscillating Fan (View 1) All Chrome fans were introduced around 1915 for use in hospitals, restaurants, doctor's offices, and other places where cleanliness is a big concern. 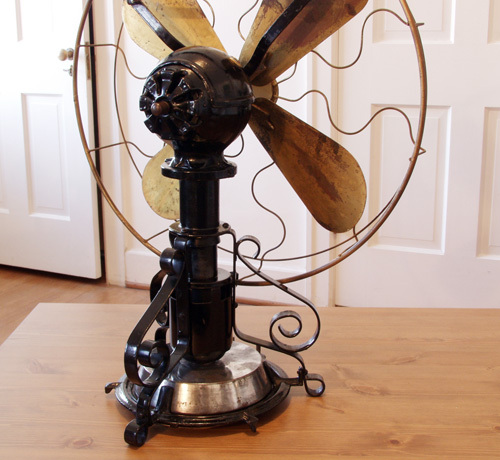 This fan was manufactured by the Fitzgerald Company of Torrington, Conn. and is a "universal" type fan meaning it will run on either alternating or direct current. c.1918 Fitzgerald Star-Rite All Chrome 10" Oscillating Fan (View 2) This view shows the brush caps on the side of the motor where the brushes are located. 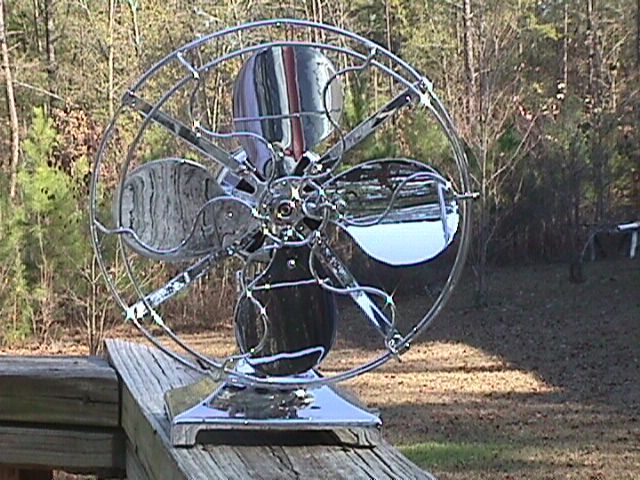 c.1918 Fitzgerald Star-Rite All Chrome 10" Oscillating Fan (View 3) Back view of the gearbox. Chrome fans sure are hard to photograph! 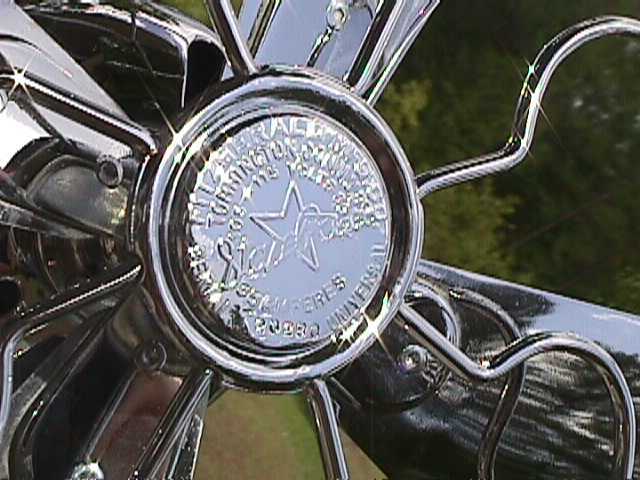 c.1918 Fitzgerald Star-Rite All Chrome 10" Oscillating Fan (View 4) Close up of the attractive badge. 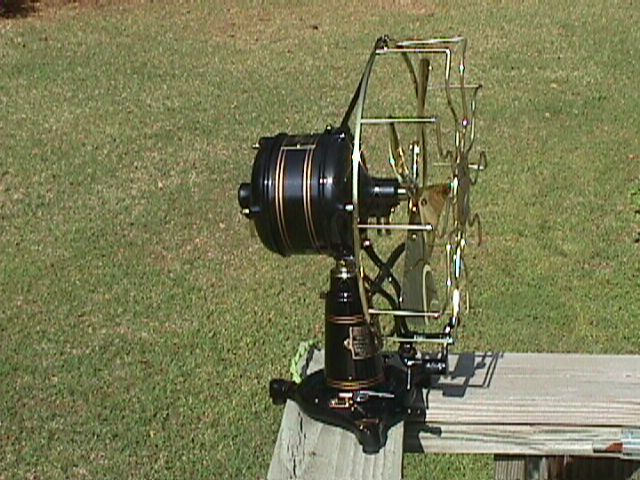 c.1918 Fitzgerald Star-Rite All Chrome 10" Oscillating Fan (View 5) The "Off-High-Medium-Low speed indicators are stamped into the base. The switch lever moves from the Off position to the left or in a clockwise movement which is backwards from most other fans. c.1918 Fitzgerald Star-Rite All Chrome 10" Oscillating Fan (View 6) Looking down on the fan you see that there is no motor tag. The manufacturer's name, model number, serial number, and motor information is located on the badge. This is one of my favorites of all of the chrome fans. 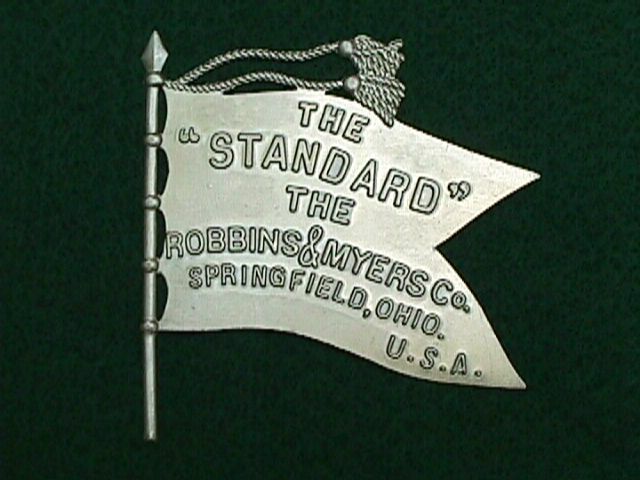 Robbins & Myers (R&M) Flag Badges During the early years of Robbins & Myers' fan production they used a badge on the front center ring of their fan guards that was made of thin sheet brass. 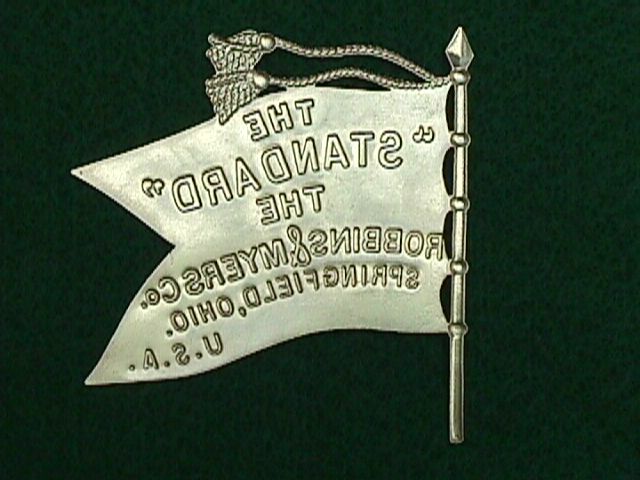 These flag shaped badges were beautiful and highly detailed with the words "The Standard" and the company name and location stamped into the brass, but they were only .010" thick (that's about as thick as 3 sheets of paper) and almost foil-like. They are often found broken or missing all together. I have recently reproduced these flag badges in very much the same way they were made by R&M nearly 100 years ago, by stamping them with a die. Much time and effort went into the recreation of these badges in order to reproduce them with the same amount of detail as the originals. These flags are incredibly original looking. Compare both front and back sides of my reproduction flag to an original R&M flag by laying them side by side. I think you will agree that these are very good reproduction replacement flags. Contact me if you need one. Robbins & Myers (R&M) Flag Badges (back view) Here is the back view of the flags I have reproduced. Compare detail to an original R&M flag. 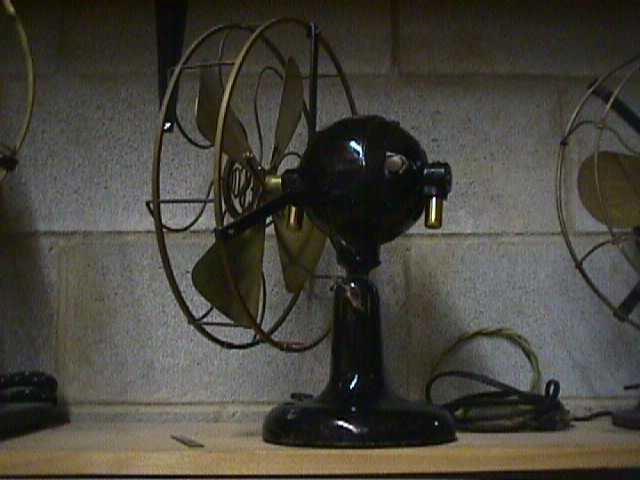 This is a 1952 Vornado fan that I restored in March of 2005. I used a metalflake Amethyst base coat / clear coat automotive paint. $150 a pint including all of the hardener, accelerator, and other stuff that you have to mix together to make this thing scream "Look at Me! I am hot!" More views to follow. Here's a close up of the base. As you can see I dabbled the inlaid "Vornado" with the same Amethyst color. 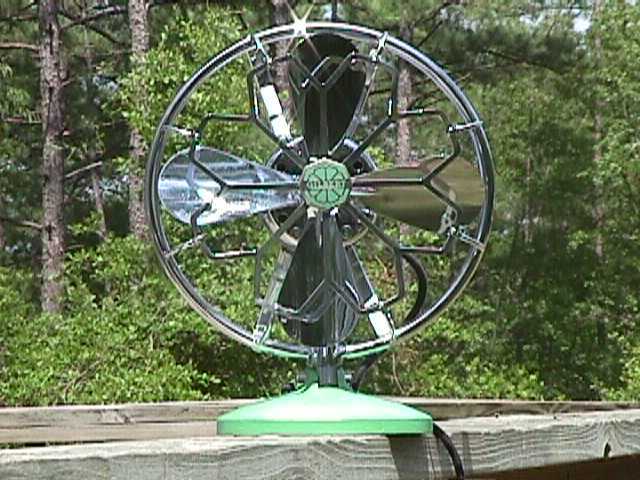 The original color inside the Vornado lettering was green. I thought the Amethyst looked better (the green kind of clashed). See my brand new feets and rivets too! Here's the back view. As you can see, I opted to chrome plate much of the rear end. This is triple show chrome and it turned out great. Nice looking rear end from a different angle. Applied Color Label Soda Bottles (ACL soda bottles) Here are some of my bottles that are on display at our fan shop. Around the turn of the century soda pop became popular and there were literally hundreds and hundreds of different flavors by the 1930s. The drink was carbonated and had to have a special bottle to hold in the fizz if the drink was not going to be consumed right away. 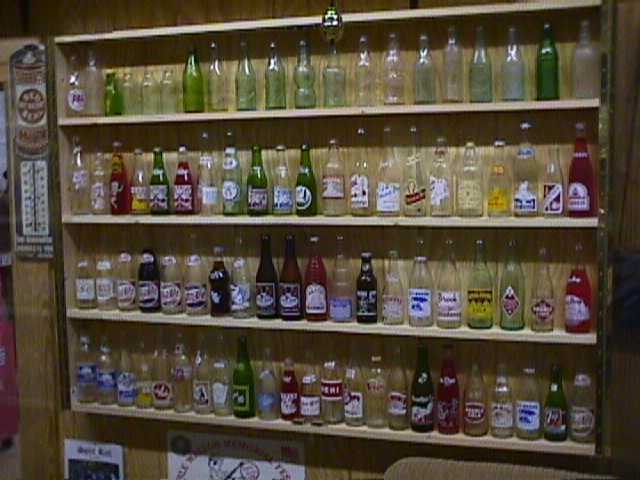 The early bottles were embossed (raised letters on the glass), then in the 1930s the painted label bottles came along. They are referred to as "applied labels" and came in either one color, two color, or three color labels. Graphics include people, landscapes and scenery, airplanes, Cowboys or Indians, and cartoon figures. Some bottles just had the name of the drink on the label. I collect bottles with neat graphics such as pretty girls, landscape scenery, and animals. Bottles must be in near mint condition with no case wear and bright vivid painted labels (not faded). 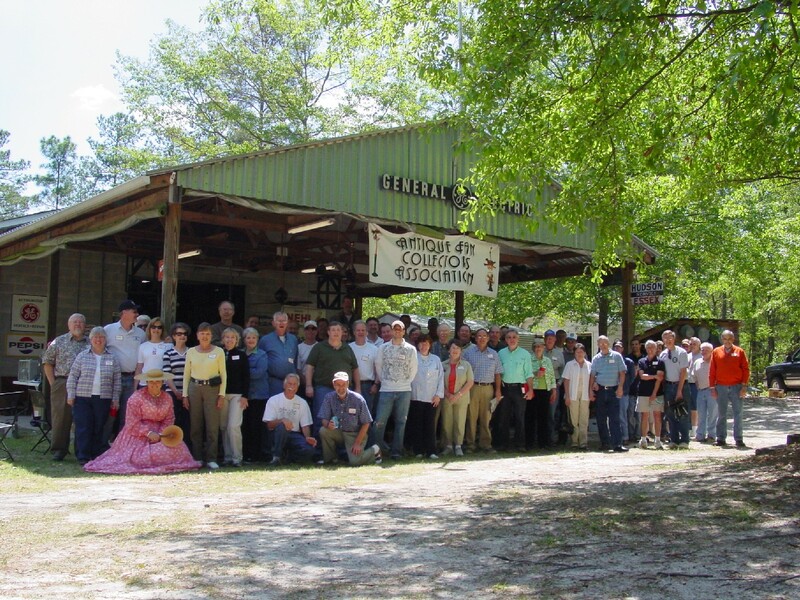 ACL bottles were produced from the 1930s until the 1970s. ACL Bottles (View 1) Here's a few bottles with a "Southern Belle" type of theme. I have most of the bottles with Southern Belle ladies on the label but I am still looking for examples that I don't have. ACL Bottles (View 2) More Southern Belle theme. The Southway bottles show a big southern mansion with a couple out front. The Holly bottle came in strawberry or orange flavor. These are unopened examples. 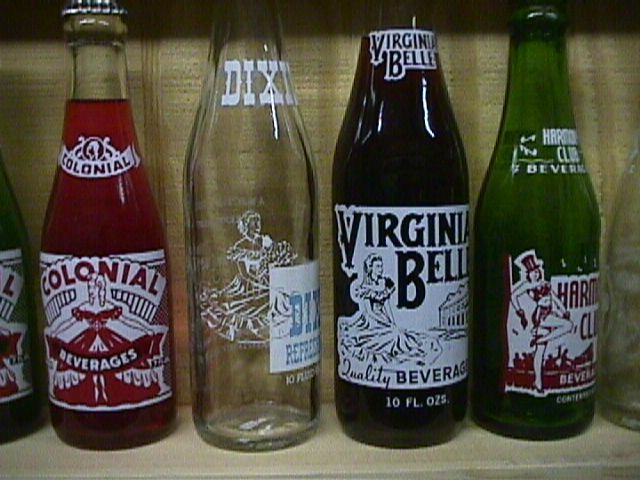 The Dixie Grape bottle shows a lady in a long dress and bonnet as does the Colonial bottle which came in a green glass bottle and a clear glass bottle. ACL Bottles (View 3) Landscapes and scenery are the labels here. 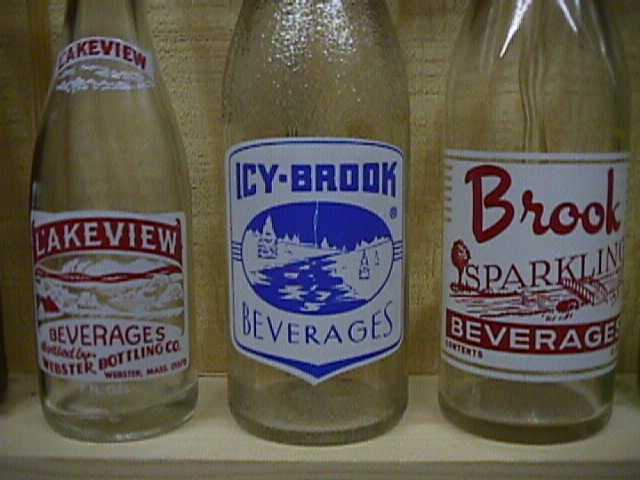 Lakeview, Icy-Brook, and Brook bottles all show a river or a creek with surrounding scenery. Makes you want to take a cool drink! 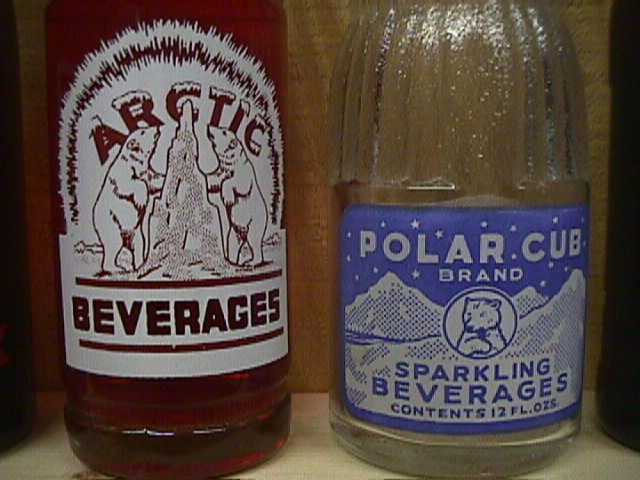 ACL Bottles (View 4) Polar Cub and Arctic Polar Bears are shown here on acl labels. Cool, refreshing thirst quenchers. Marketing strategy is very interesting with these old bottles. ACL Bottles (View5) Donald Duck and Black Kow are interesting bottles. There are two different Donald Duck bottles and they are both different in label and shape of bottle. Also the Black Kow bottles were made by two different bottle companies. 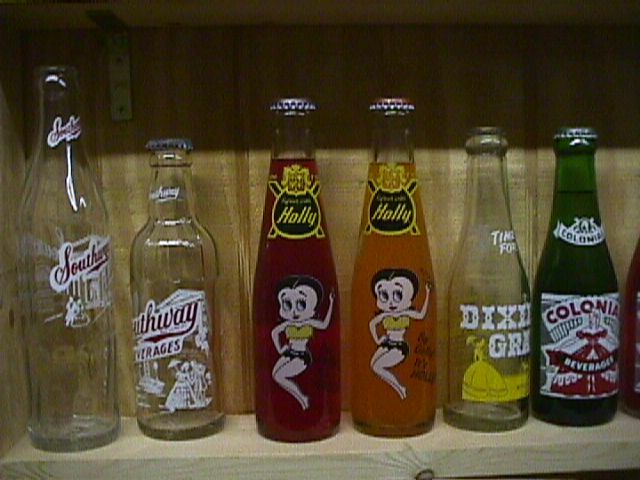 The labels are the same but one amber glass bottle was manufactured by the Ball Fruit Jar Company and the other bottle was made by Duraglas which was in the soda bottle manufacturing business and made many bottles for hundreds of different labels. 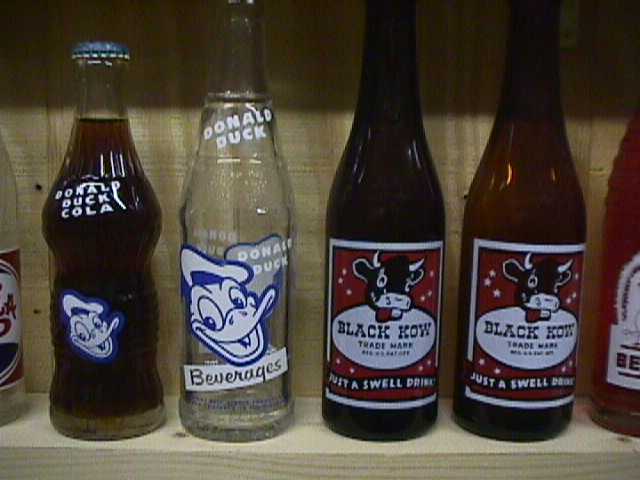 The Black Kow is the only soda bottle I know of that was made by the Ball Company. ACL Bottles (View 6) Okay one last Cowboy label bottle and I'll quit with the bottles. 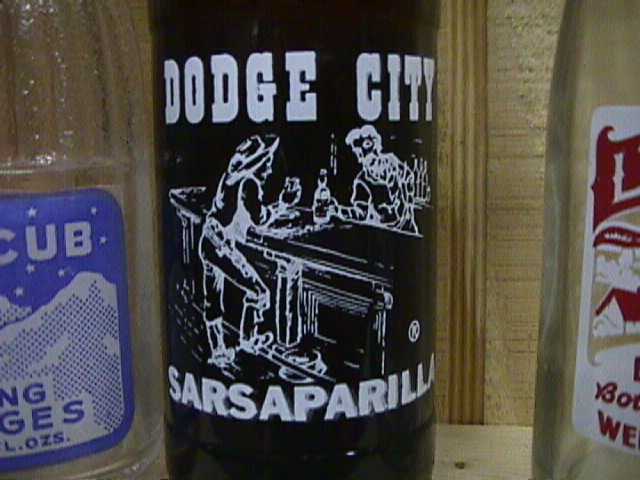 I like this Dodge City bottle. Notice the spittoon on the floor under the railing. Cowboy and Indian labeled bottles are very collectable. 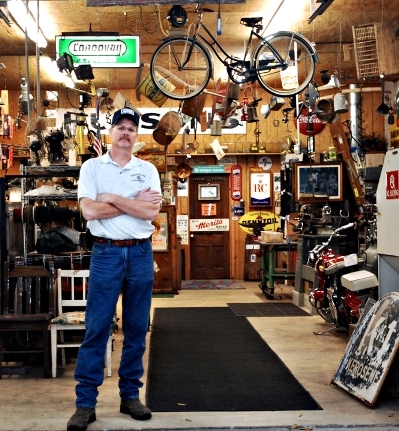 Some collectors specialize in Cowboy and/or Indian bottles exclusively. I like the Southern Belle ladies. There's more to come. Stay tuned. This section of our page is "Under Construction". Please check back soon.